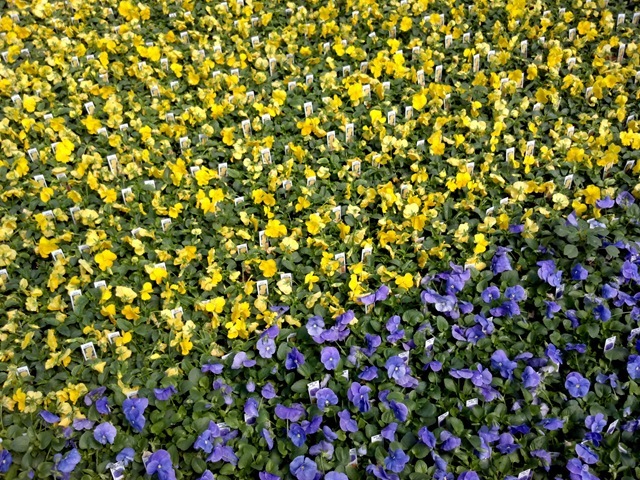 Once again I am pressed for time. 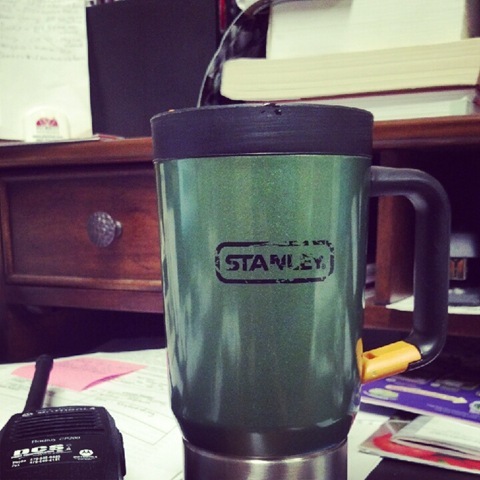 I broke my tooth last night at dinner so I have to cram everything in this morning before going to the dentist. 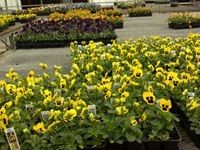 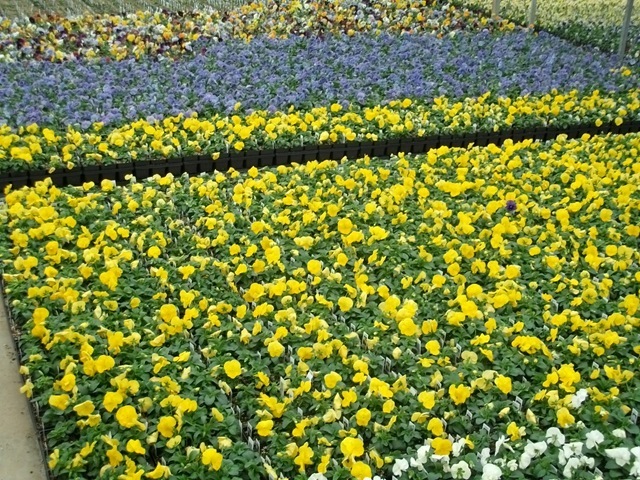 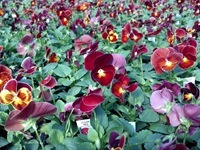 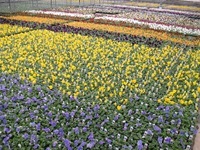 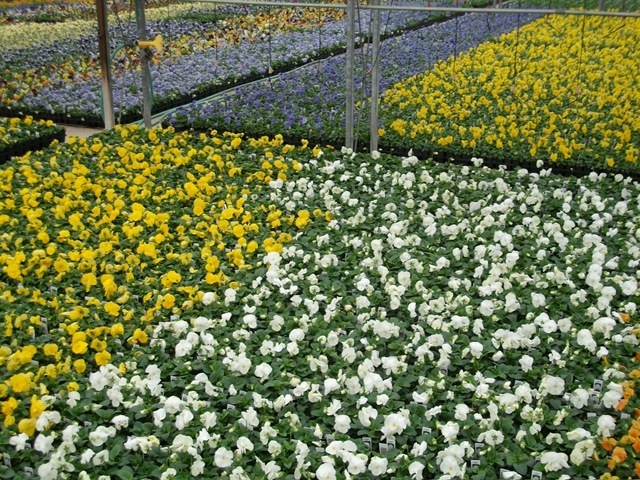 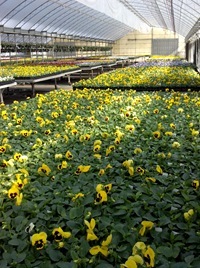 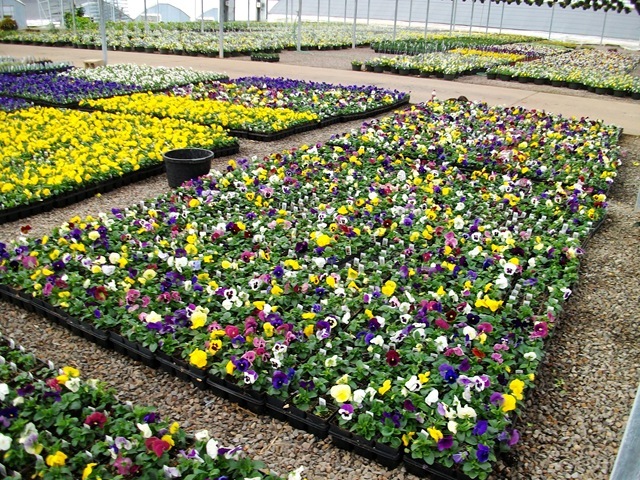 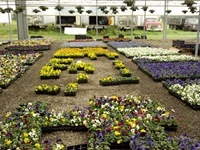 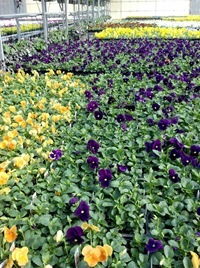 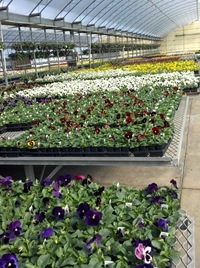 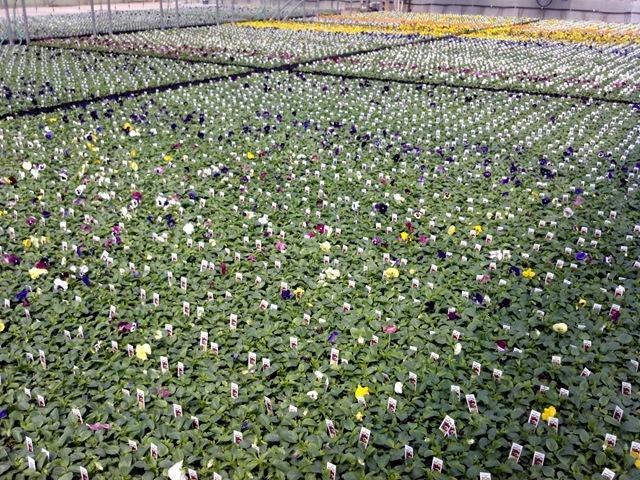 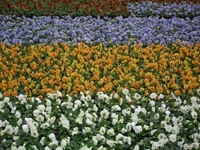 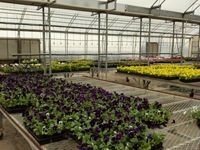 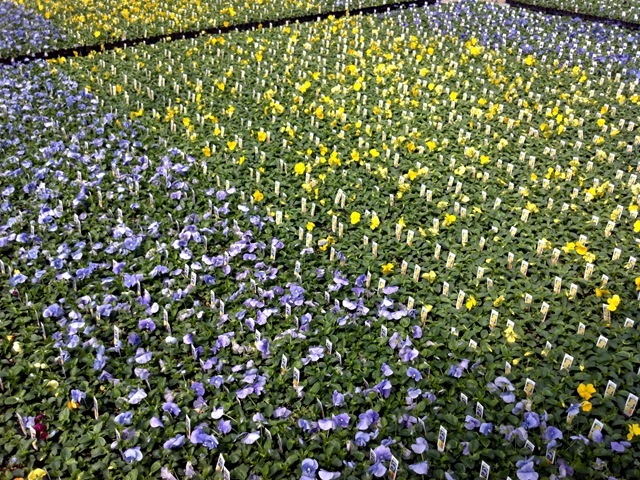 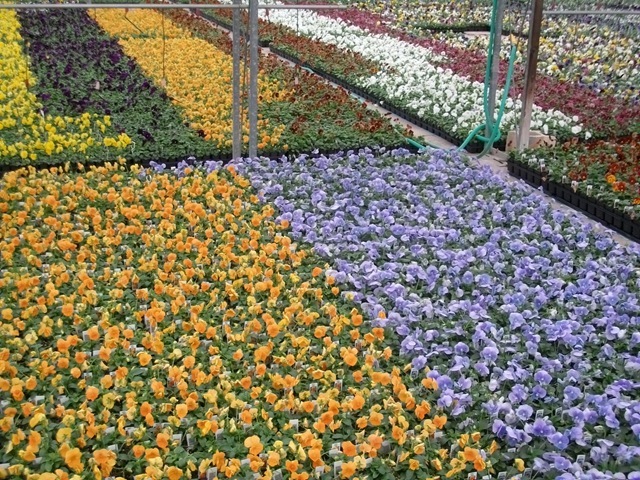 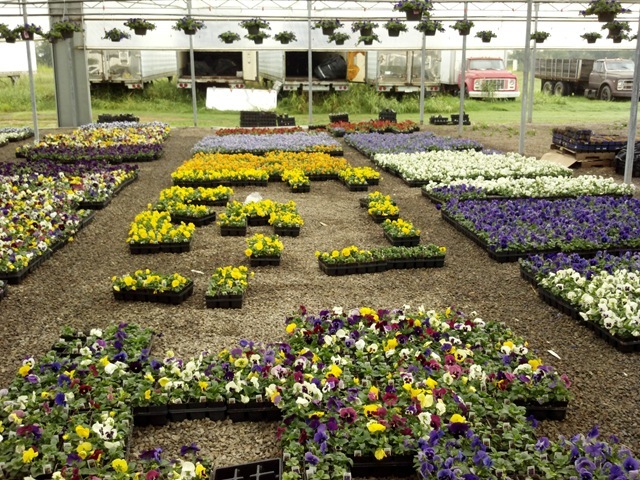 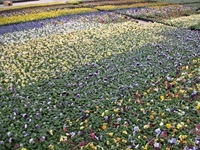 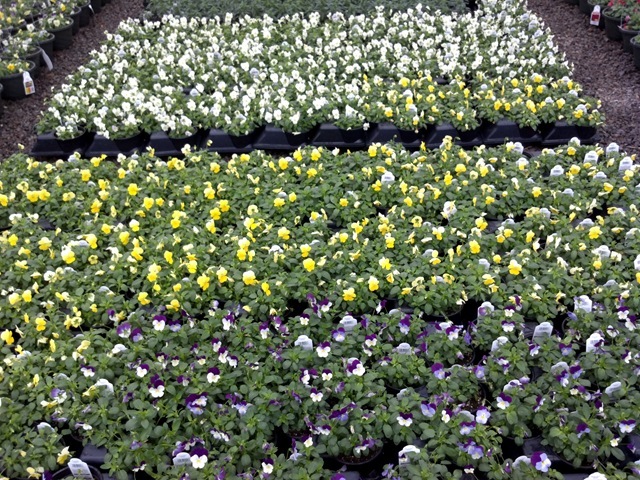 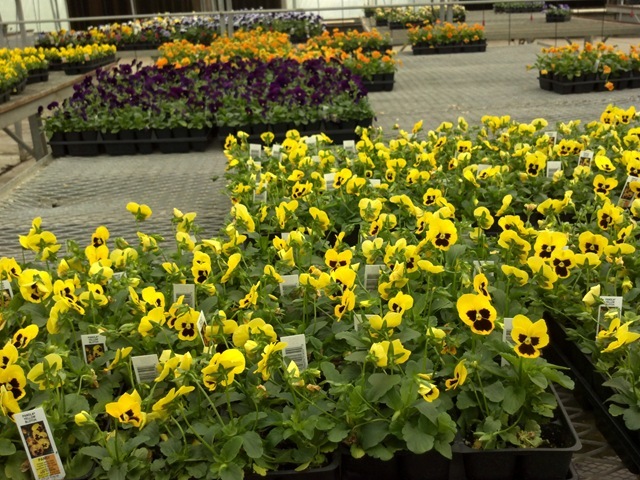 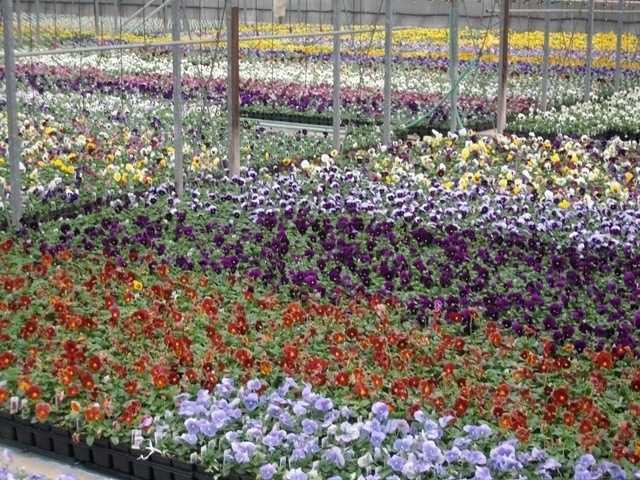 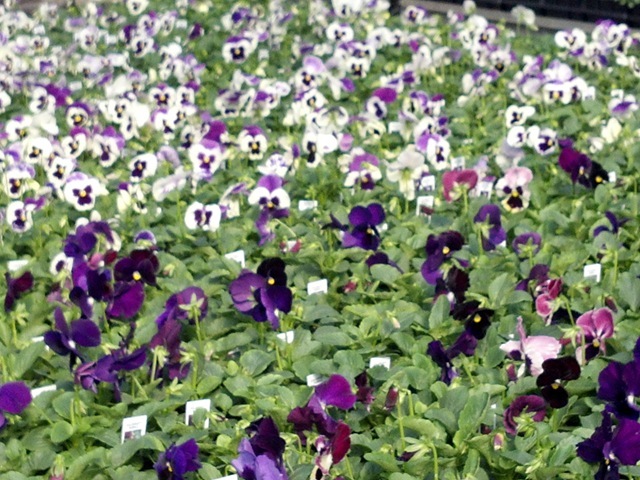 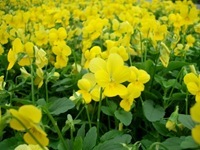 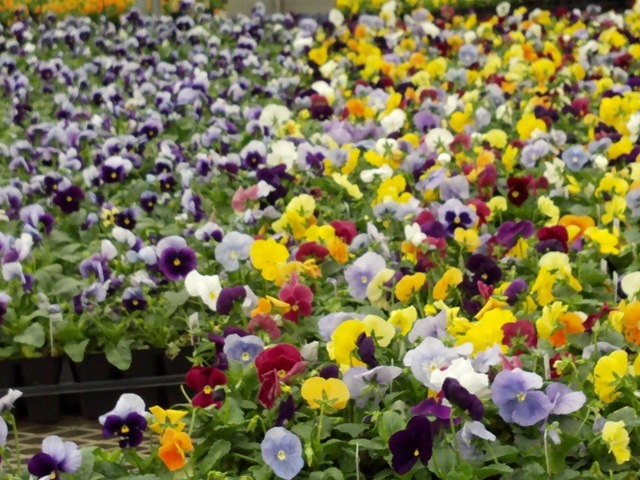 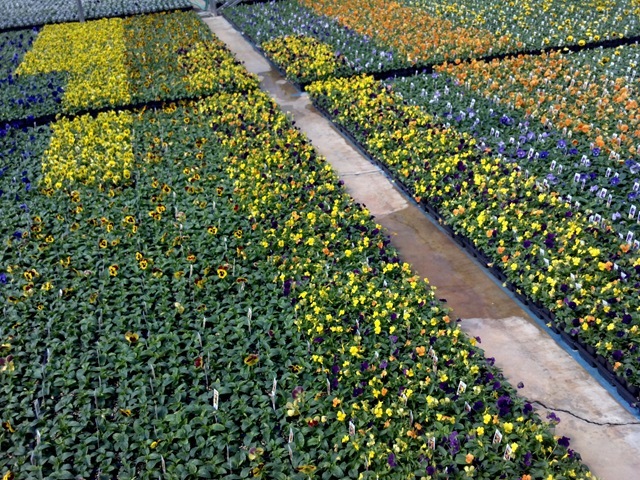 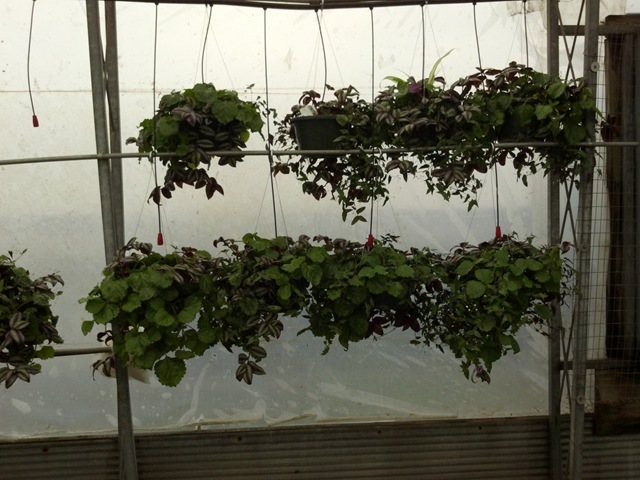 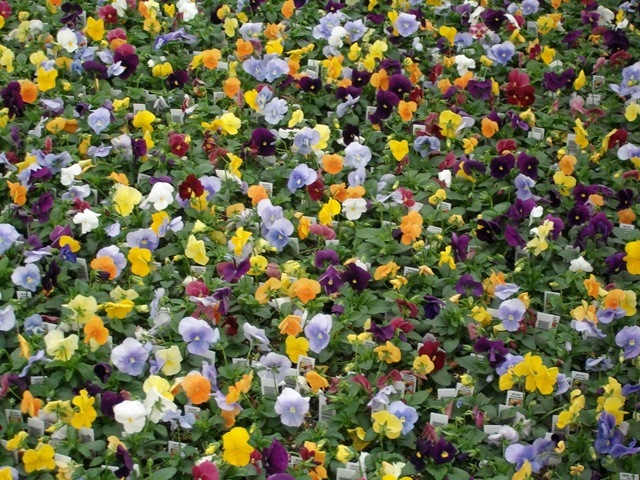 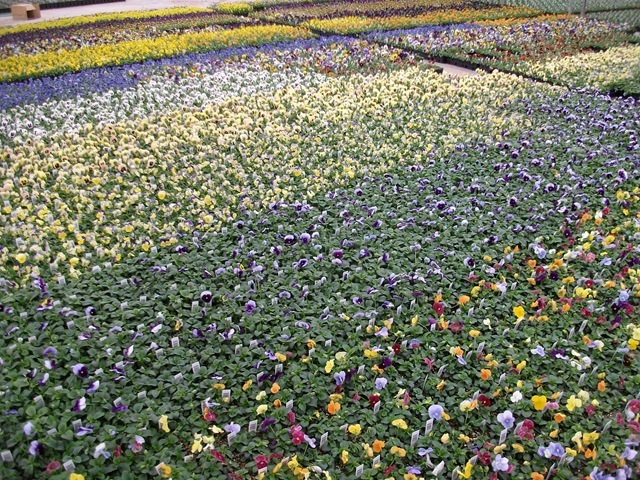 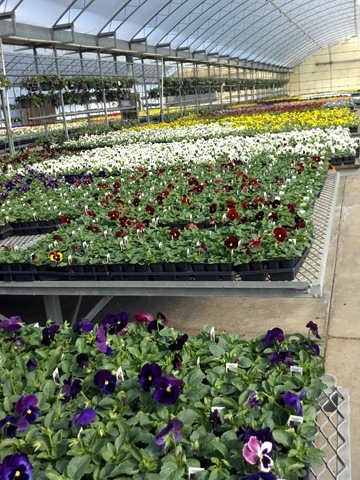 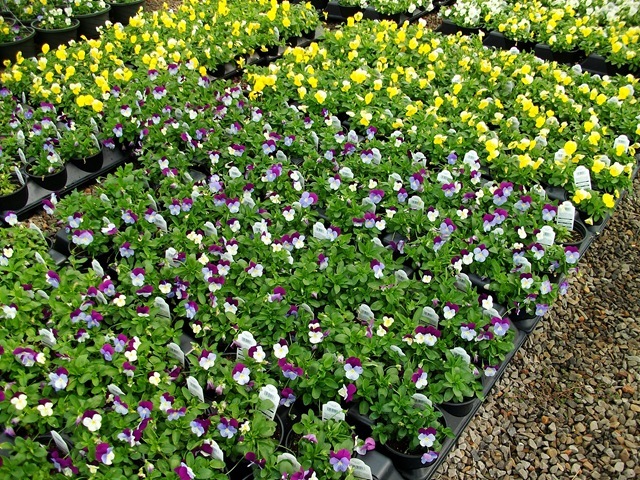 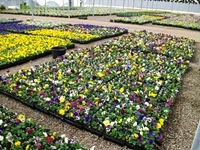 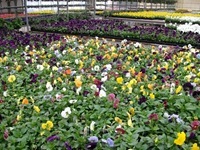 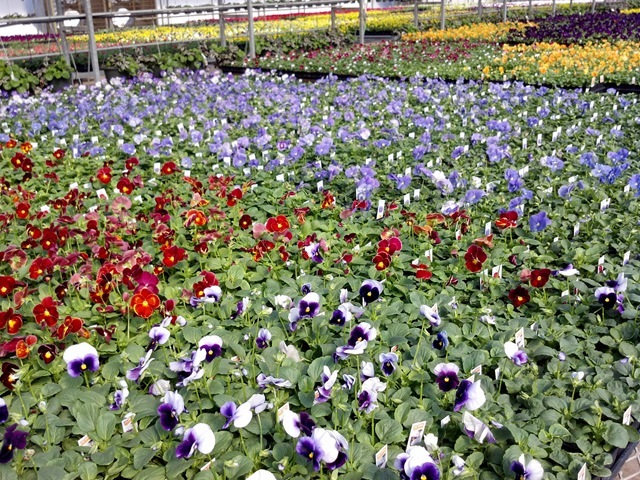 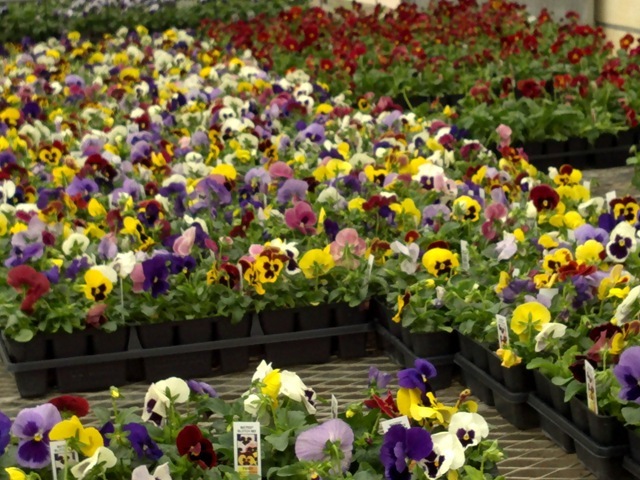 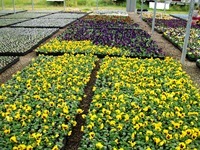 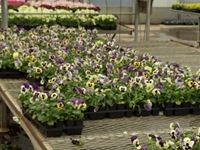 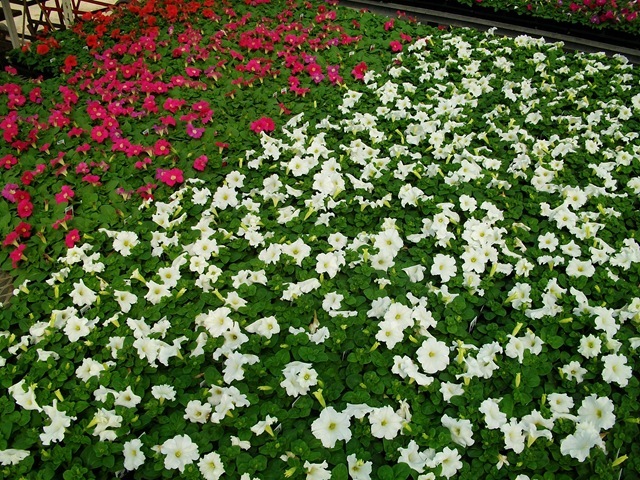 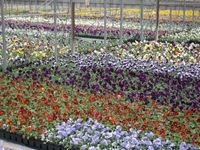 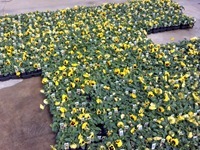 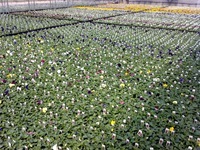 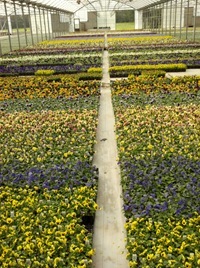 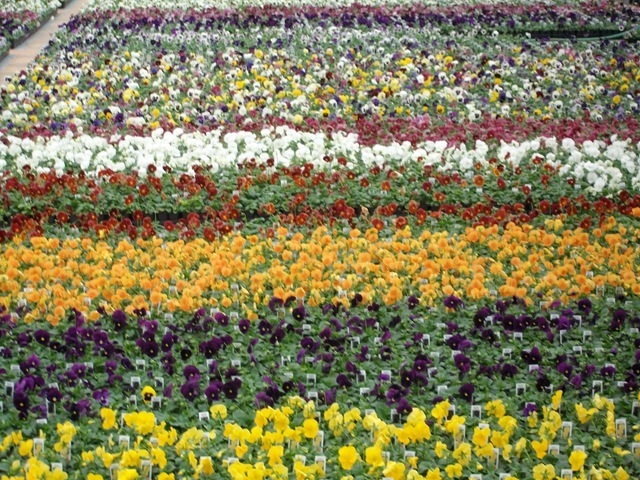 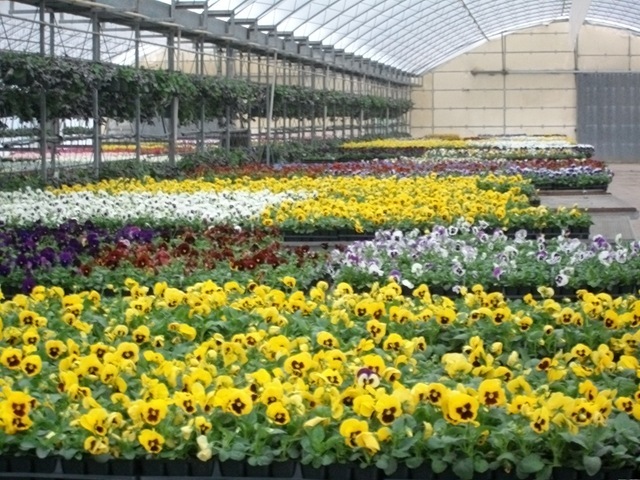 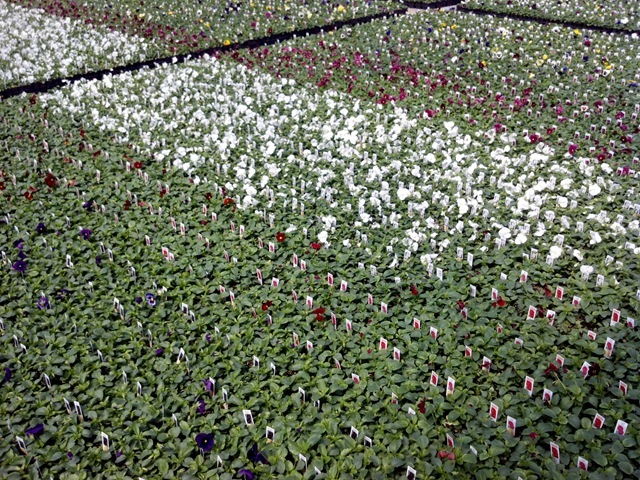 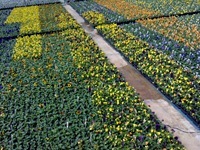 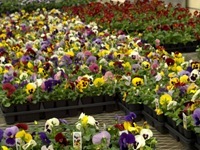 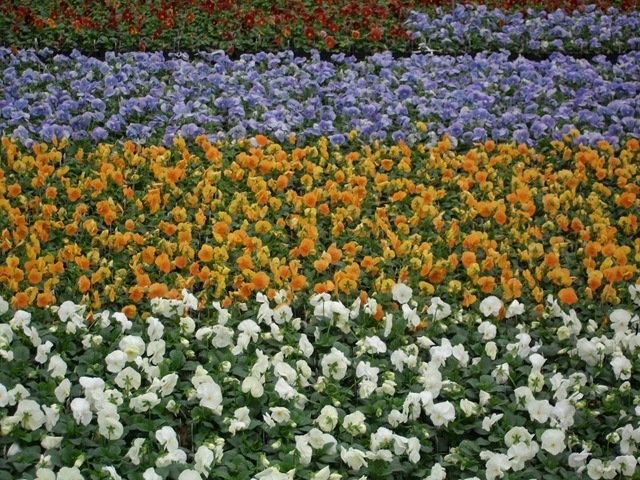 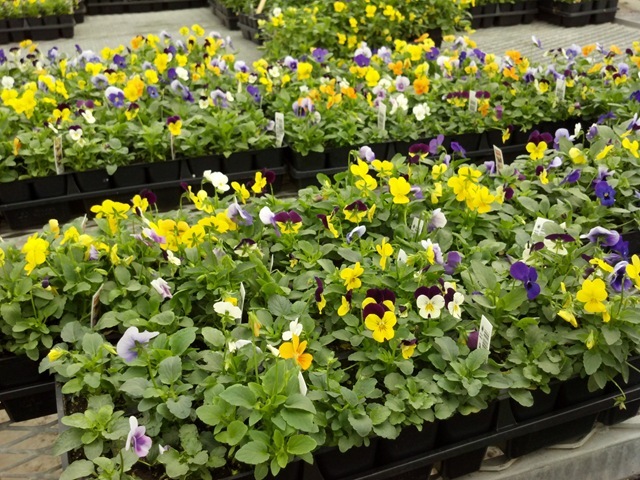 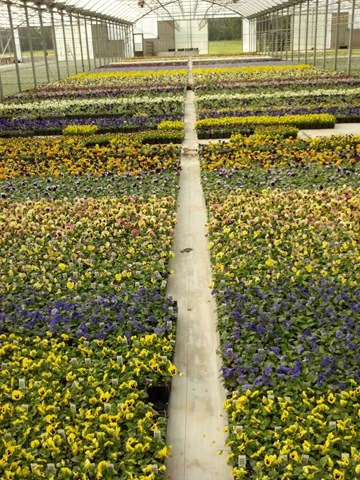 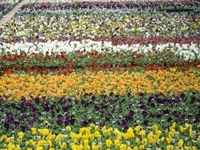 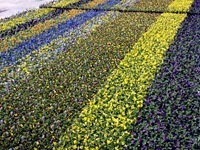 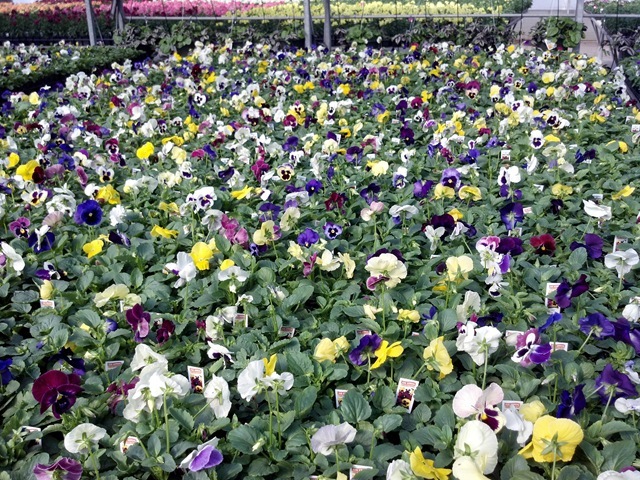 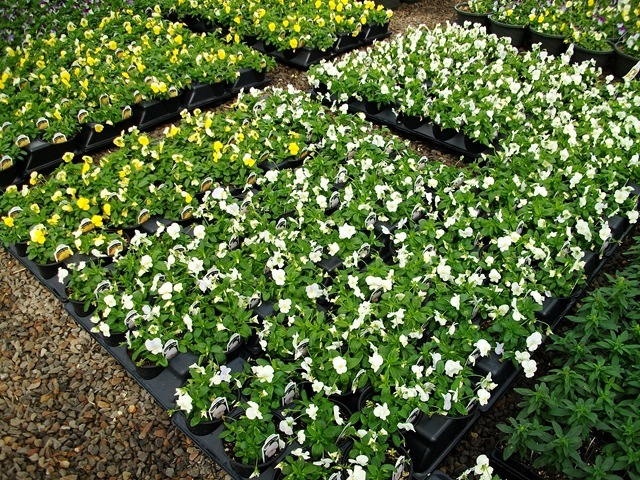 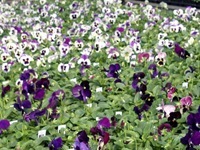 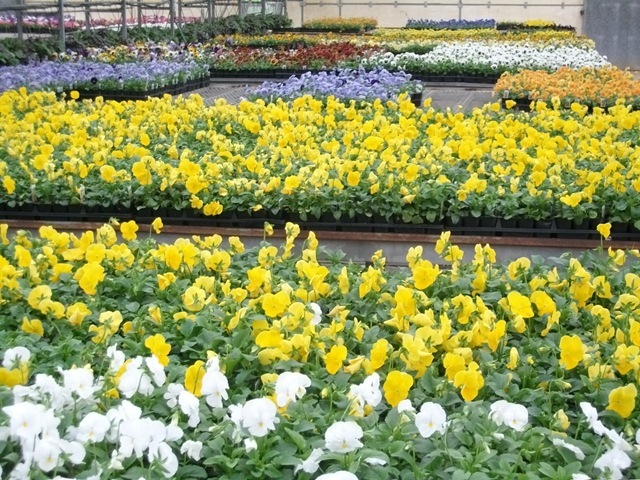 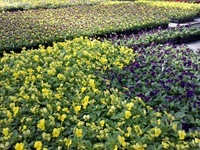 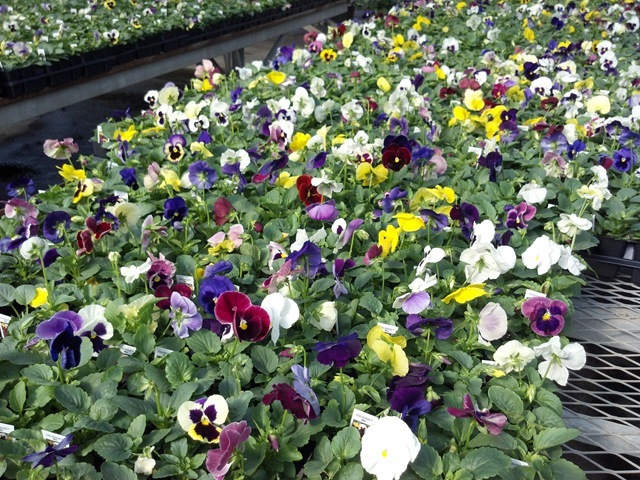 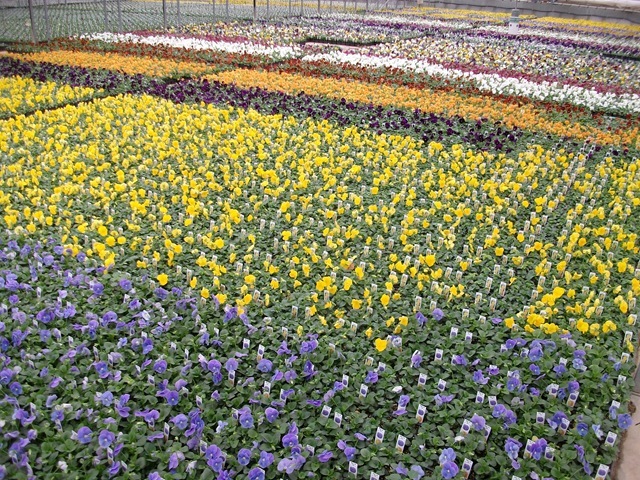 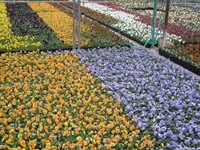 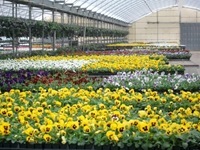 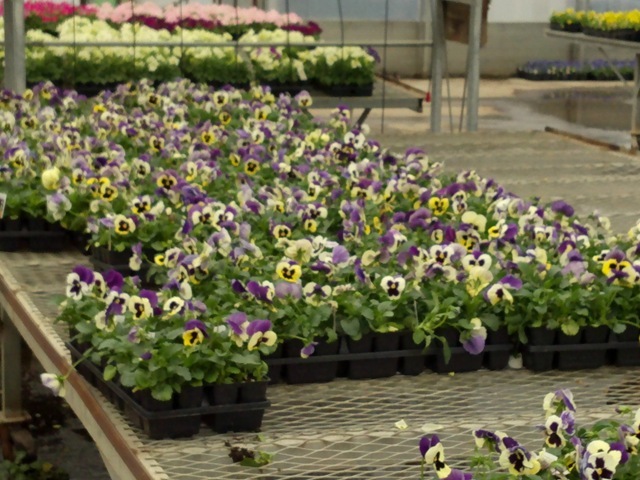 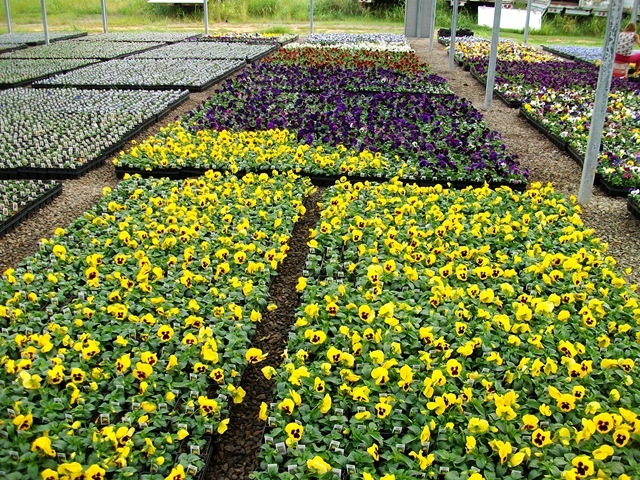 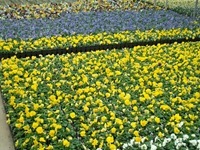 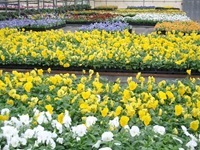 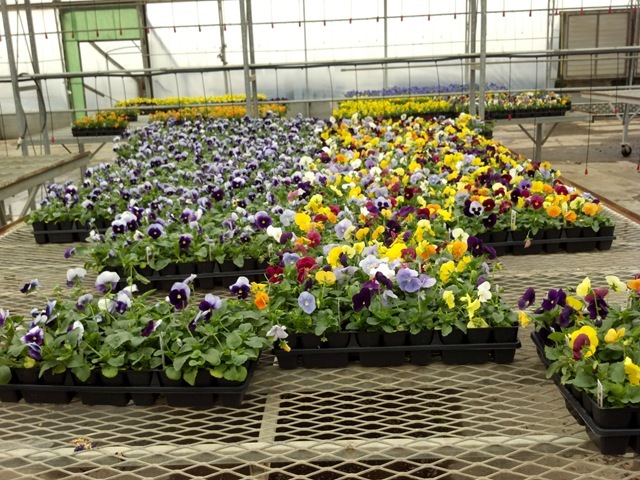 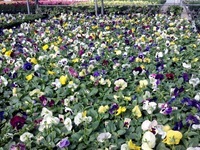 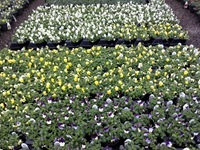 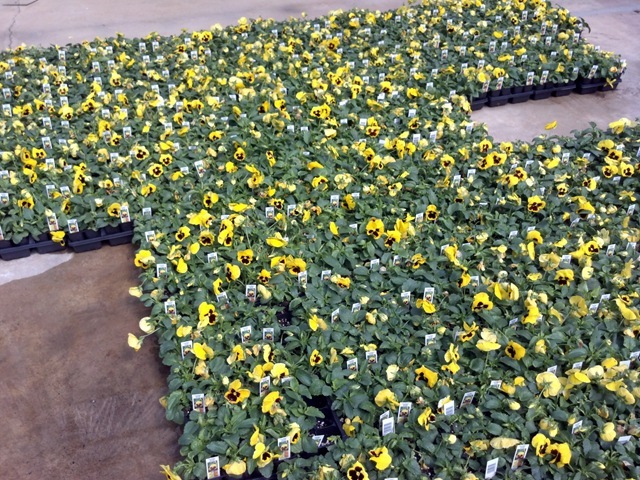 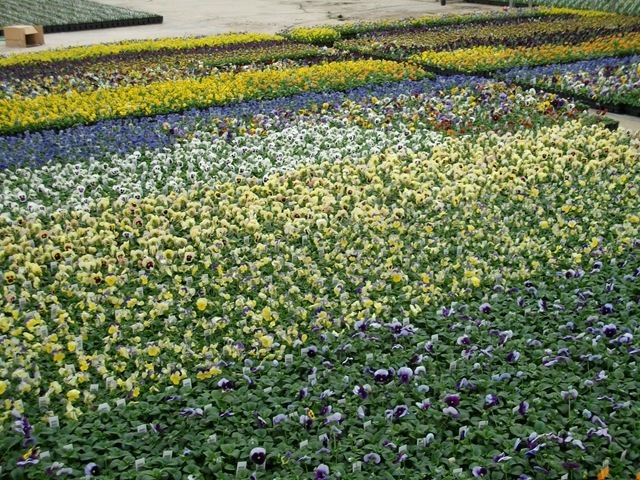 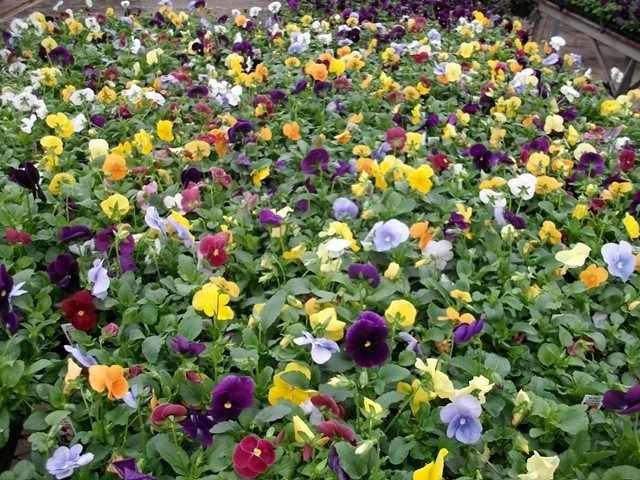 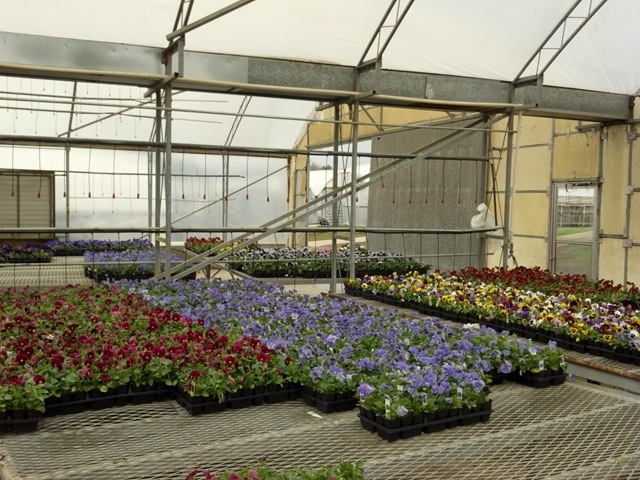 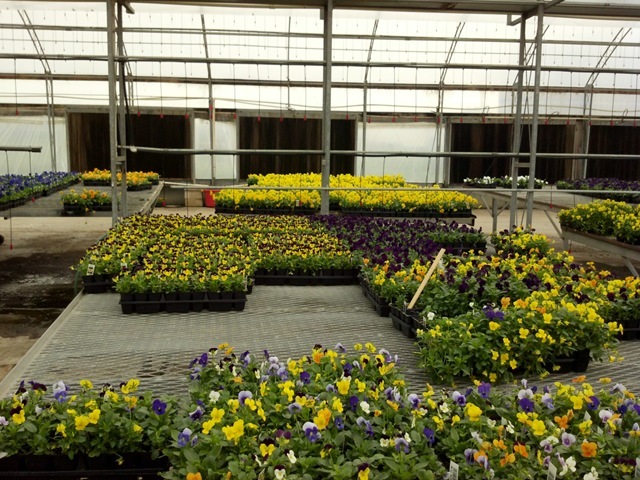 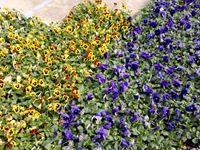 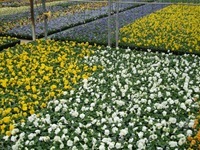 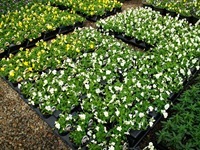 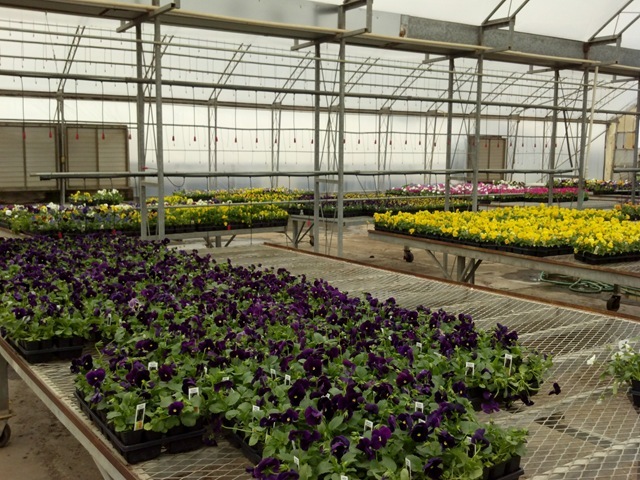 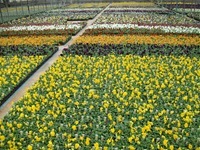 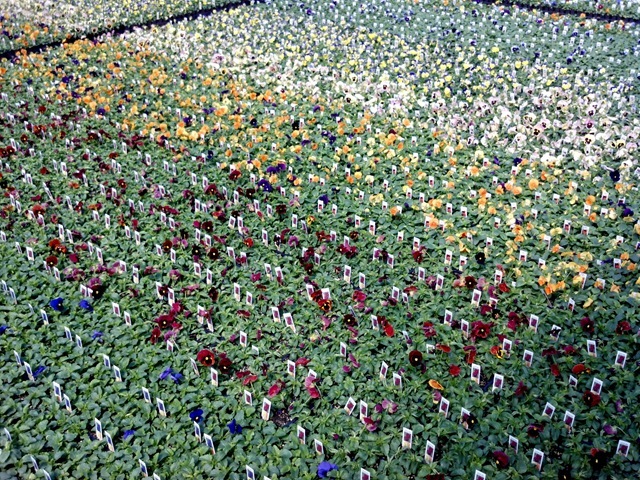 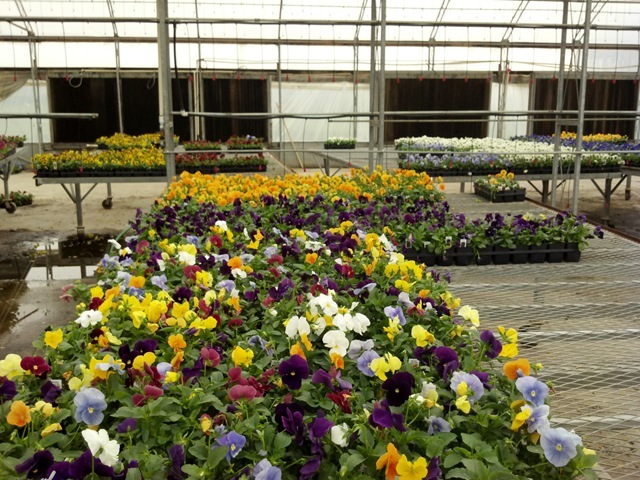 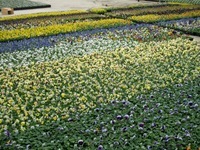 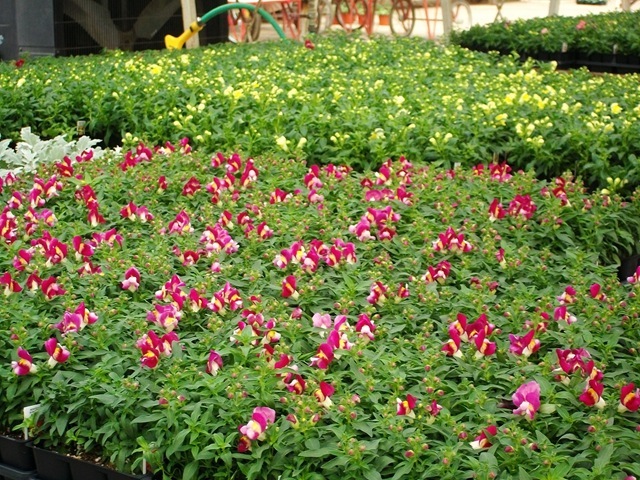 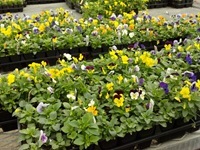 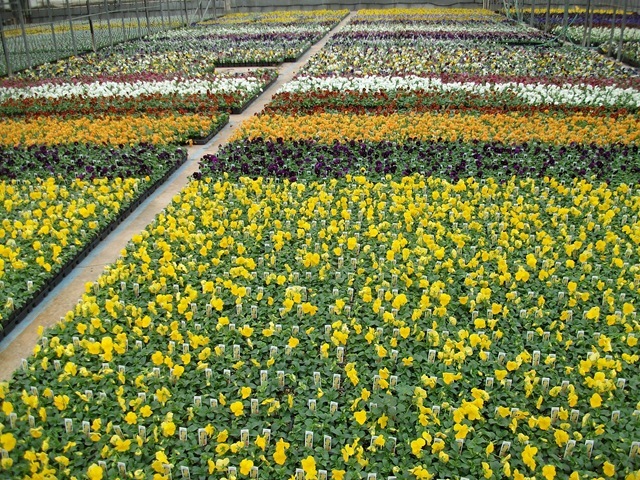 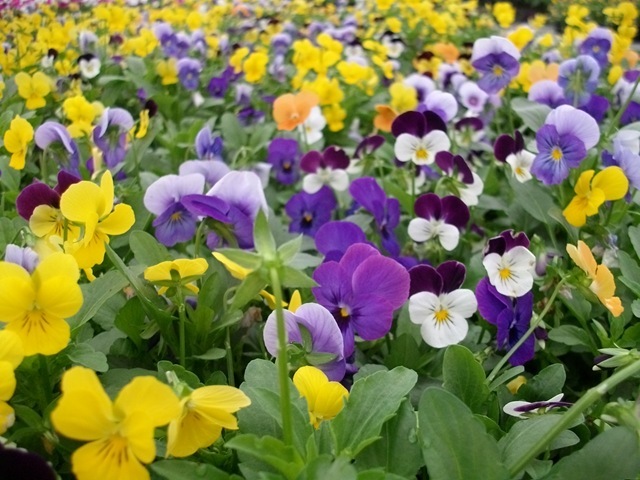 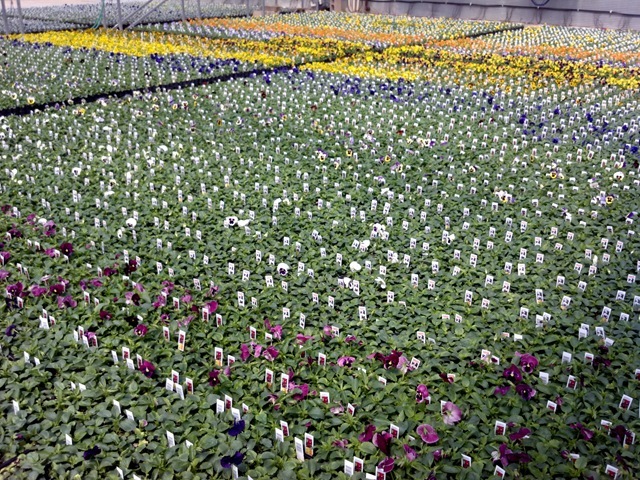 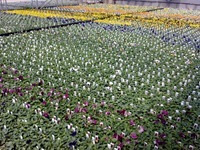 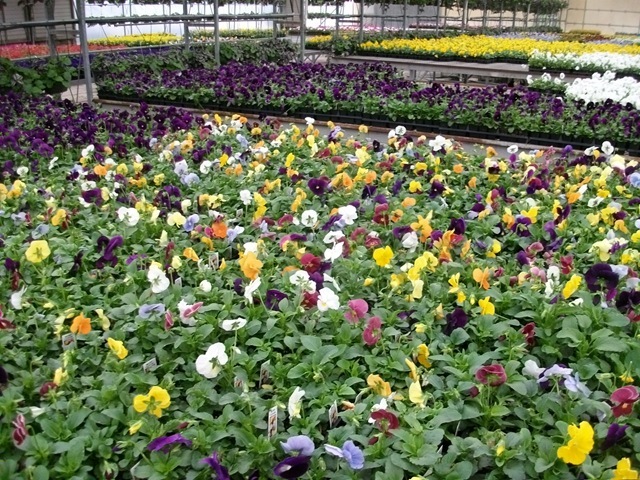 We have a lot of color showing on our pansies in all sizes, panolas and violas. 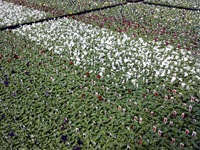 We are pulling from 2 crops of J6 the ones pictured are the current crop and the one shown on the video is the next crop which we have started stocking several colors. 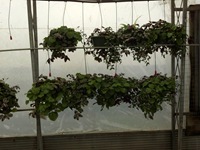 The video of the next crop is at the very bottom of the post. 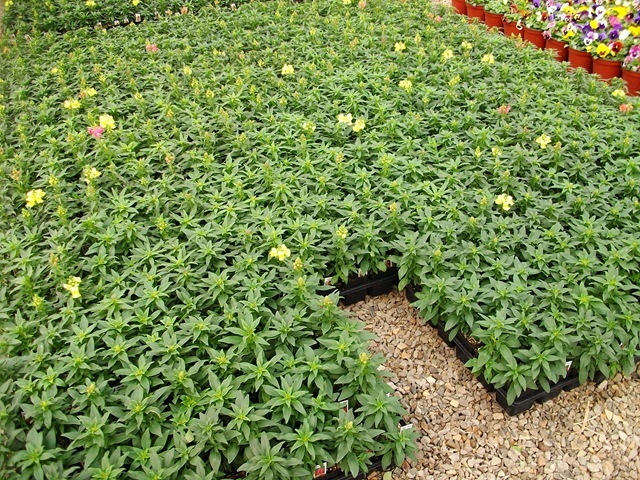 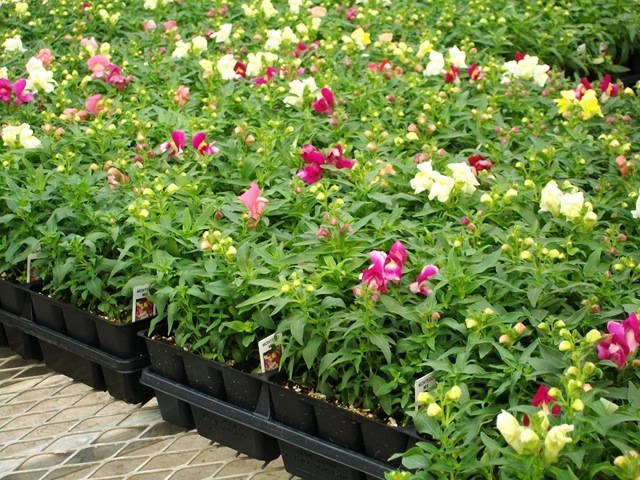 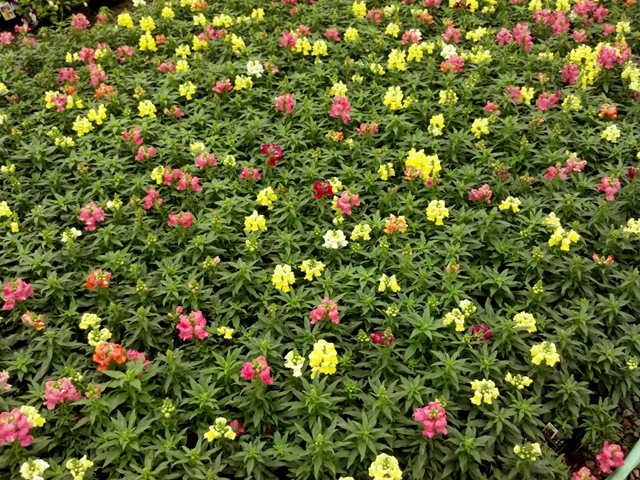 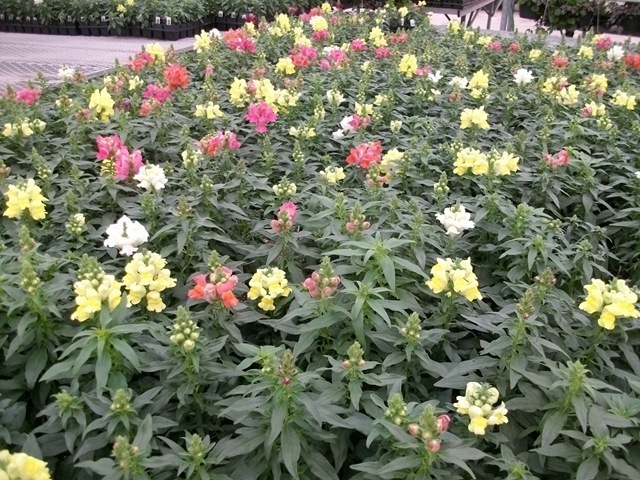 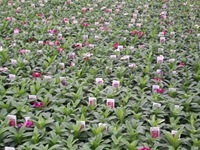 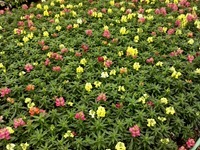 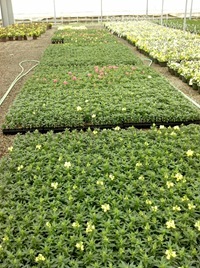 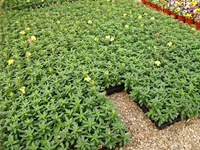 We are also into a new crop of J6 snapdragons and dianthus that are going to be very light on color. 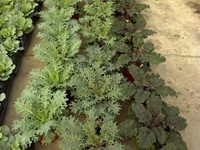 Both should have at least Buds with some Buds/Light Color by Monday or Tuesday. 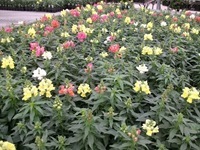 We have some mix #4 (1801) Sonnet Mix Snapdragons left of the current crop with Color and are into a new crop with solid colors in Buds and the Mix with more color. 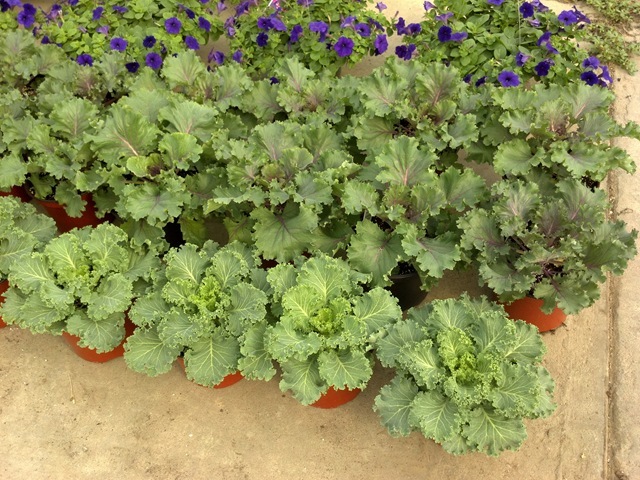 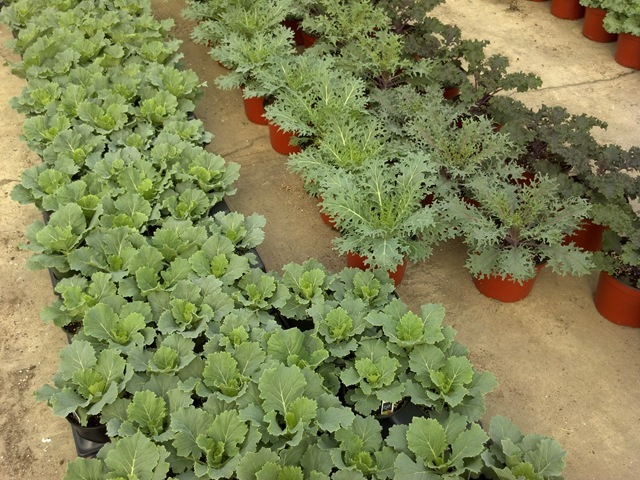 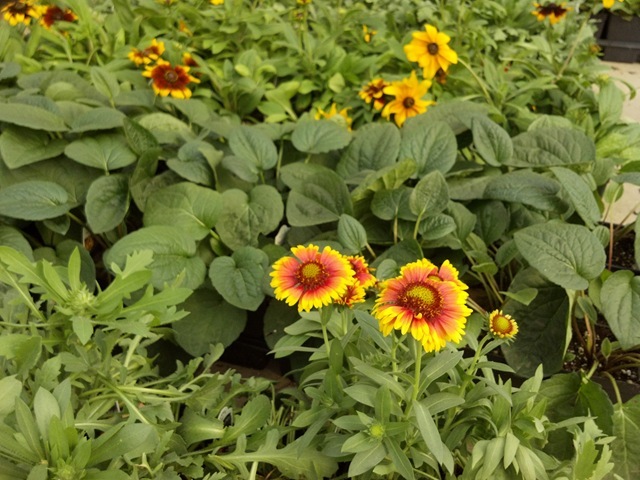 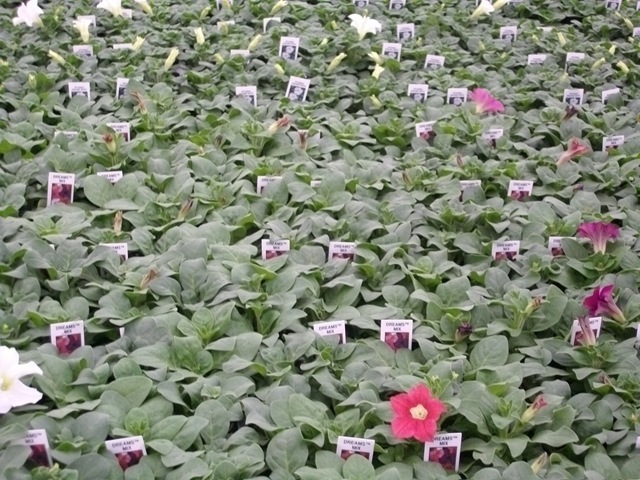 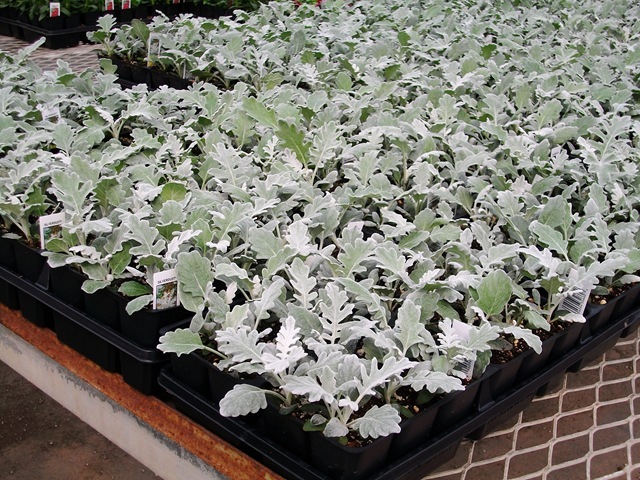 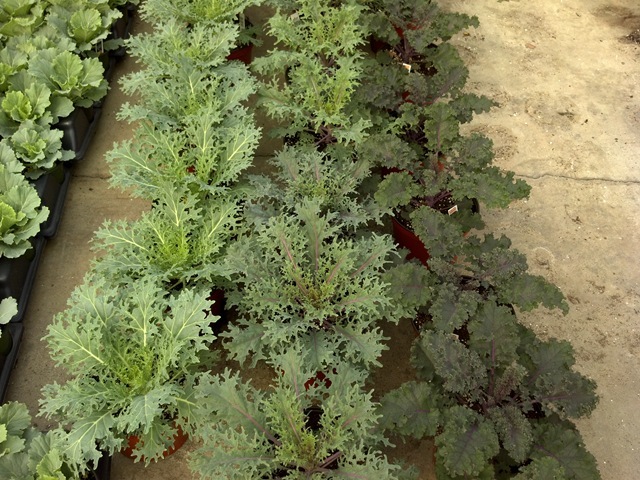 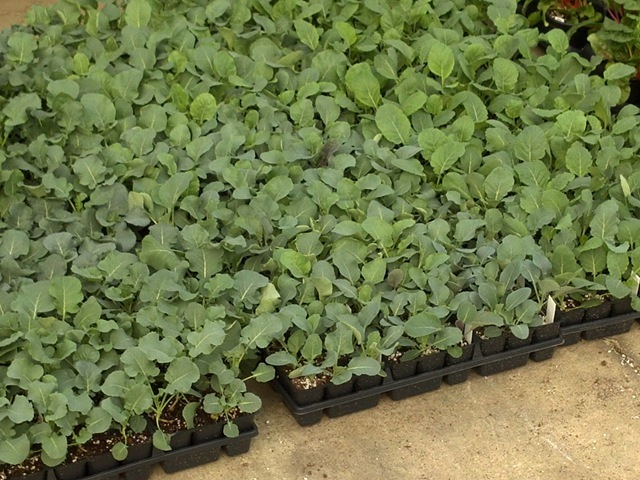 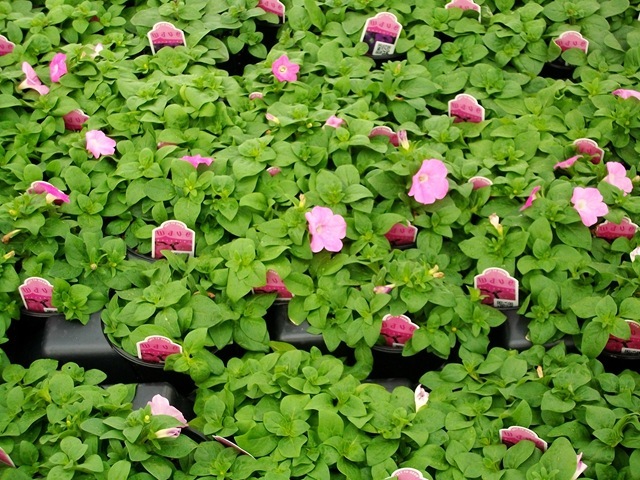 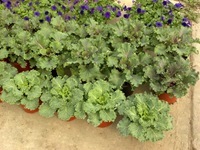 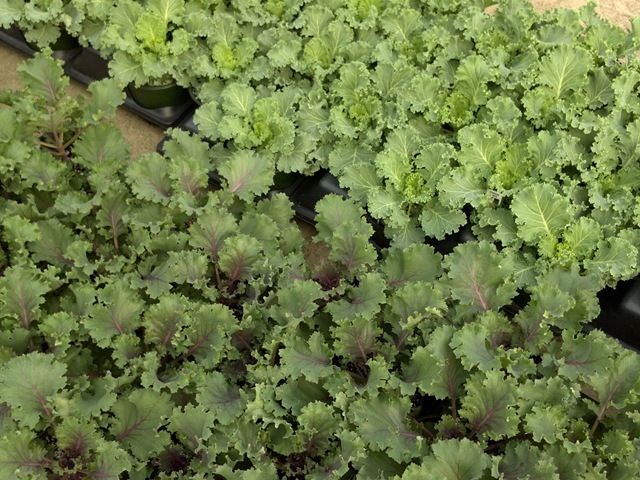 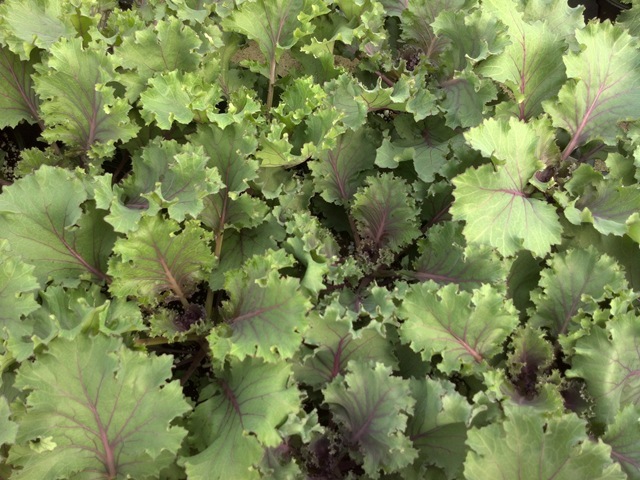 Be sure to check out the pictures of our baskets, ornamental cabbage and kale, perennials and cole crops so that you don’t miss out on some great products for next week. 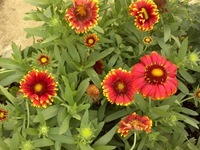 As usual, I am behind and on my 4th cup of coffee so you get lots of pictures and a video and not a lot me jabbering. 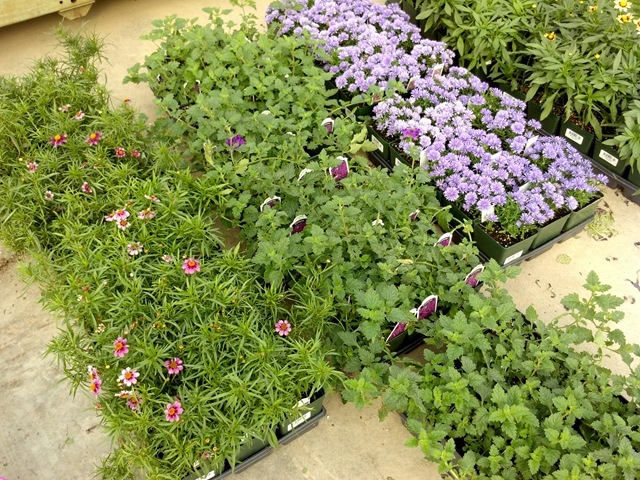 I will be adding some more perennials to the availability this weekend or Monday so if you are interested in some more of those be sure to check back on Monday. 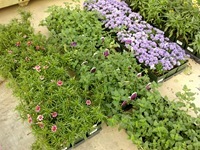 We have some more new items on the availability this week. 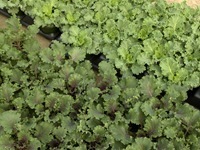 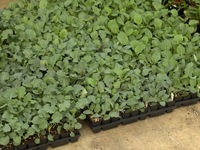 For those of you who have been waiting we now have cole crops and collards available in J6 flats. 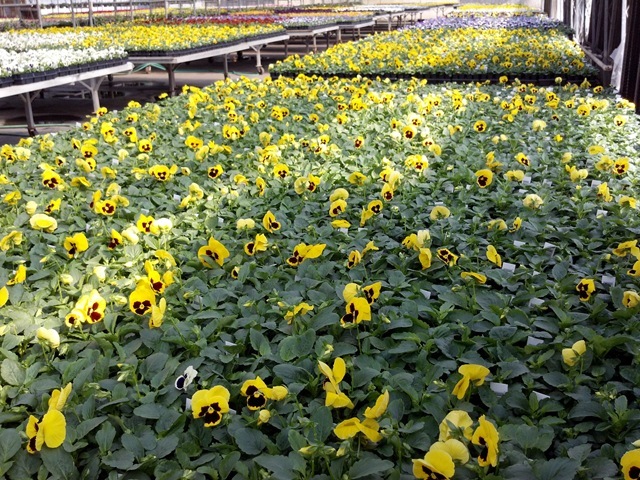 Cool new Cool Wave Pansies! And this is what the next crop looks like. 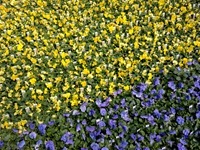 I took these pictures on Thursday and am writing this on Friday. 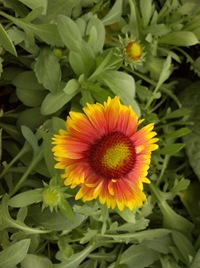 I was in this house again this morning before writing this and the color really popped out in just a day. 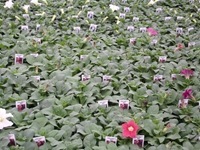 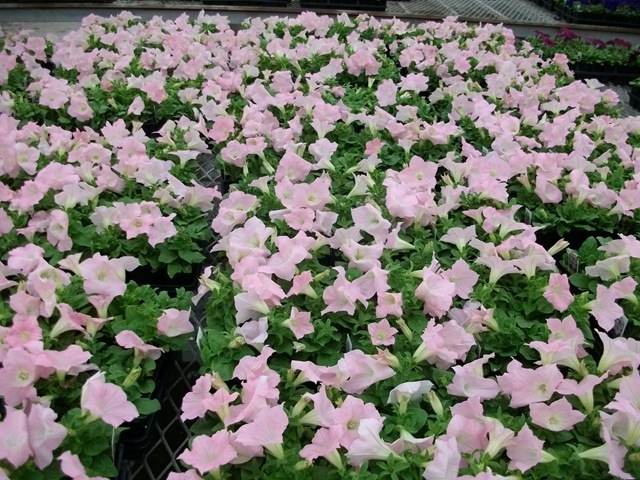 On the varieties showing less color, I estimate that the bloom counts doubled. So don’t be afraid of these, I think that we will have a lot more color out on these by Monday and Tuesday! 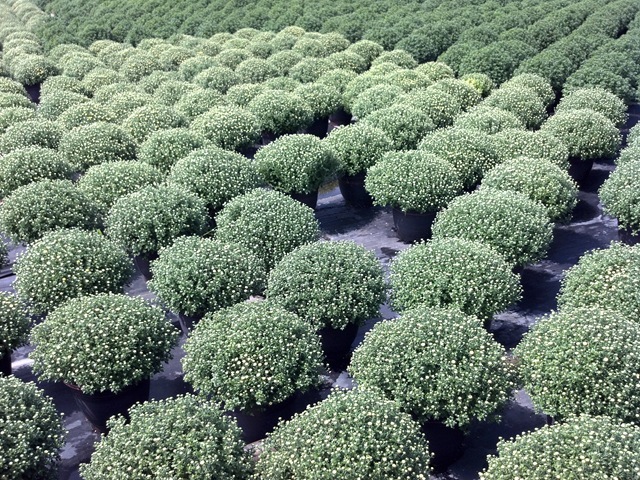 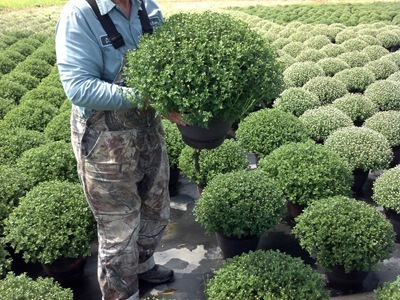 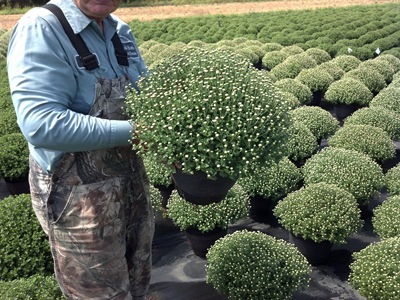 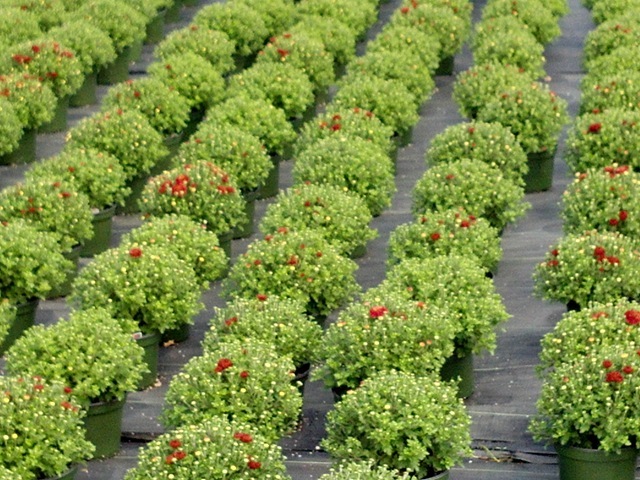 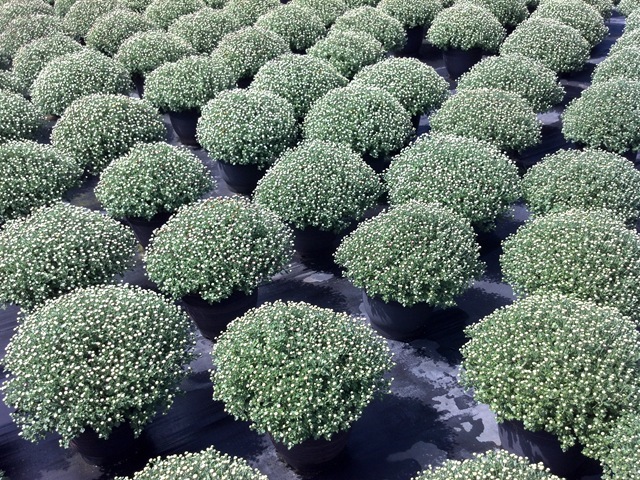 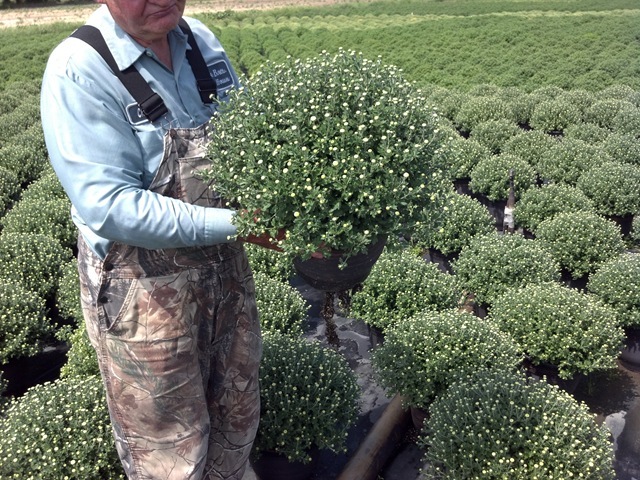 Mums – we are scrambling to keep up on our 8” mums. They are going out fast. We have a few left on the availability and after those are gone, we will most likely be out for the year. 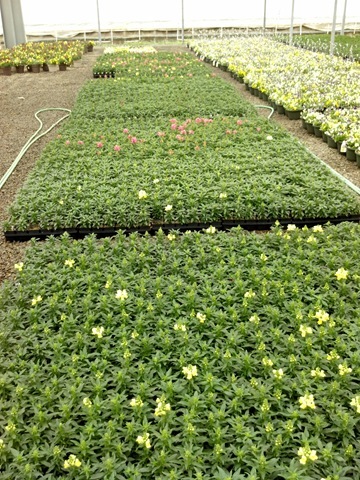 I will have a better idea of where we are at by the end of next week. 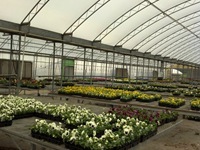 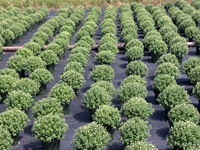 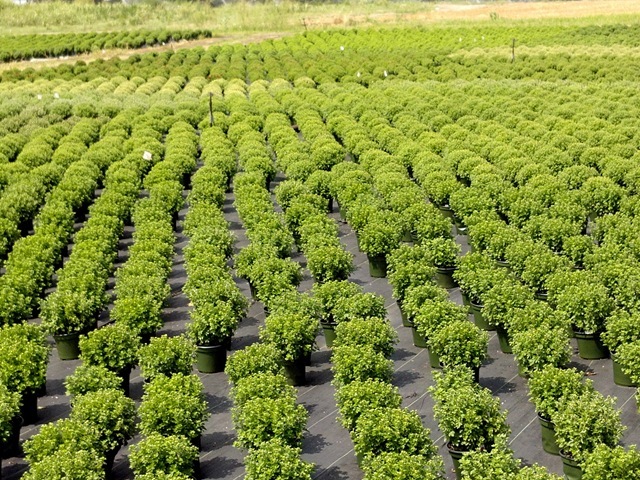 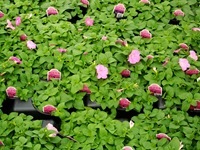 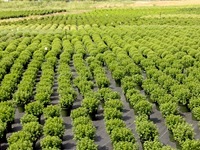 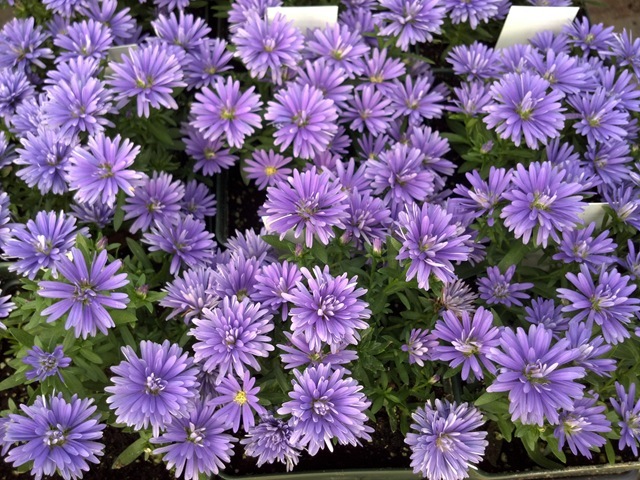 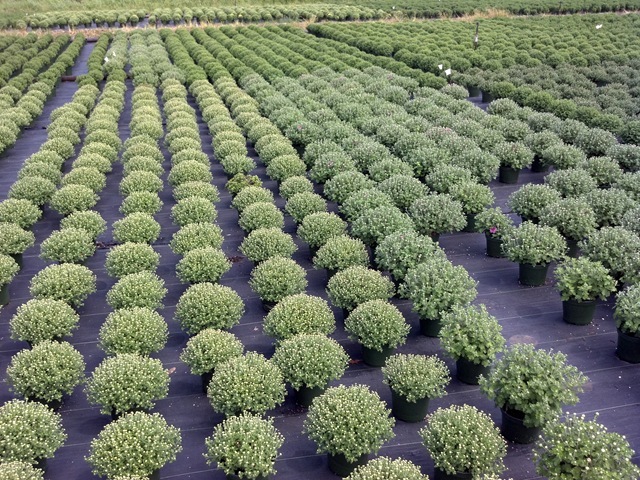 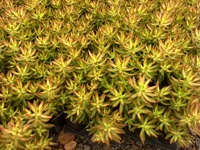 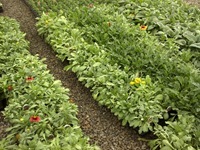 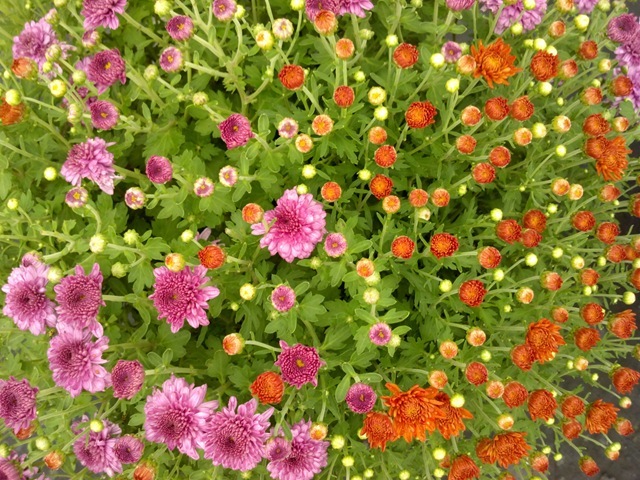 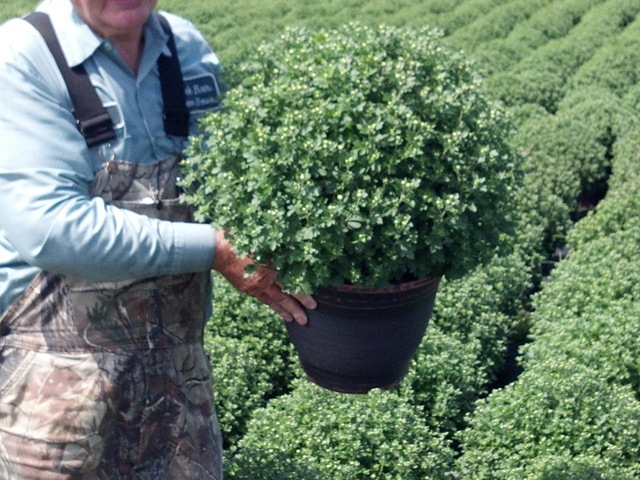 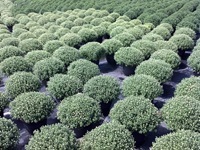 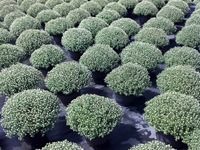 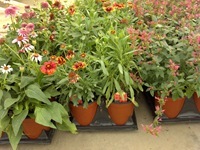 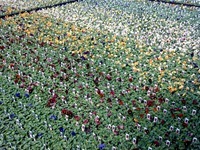 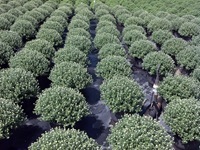 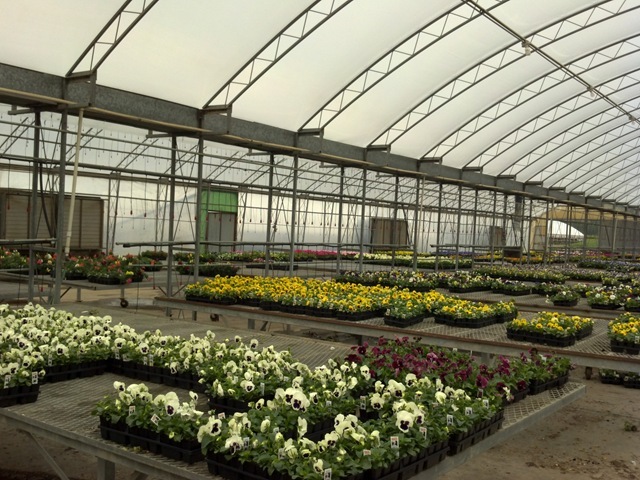 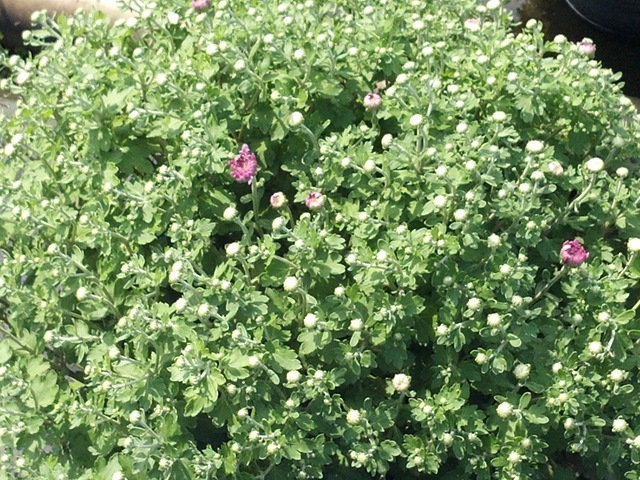 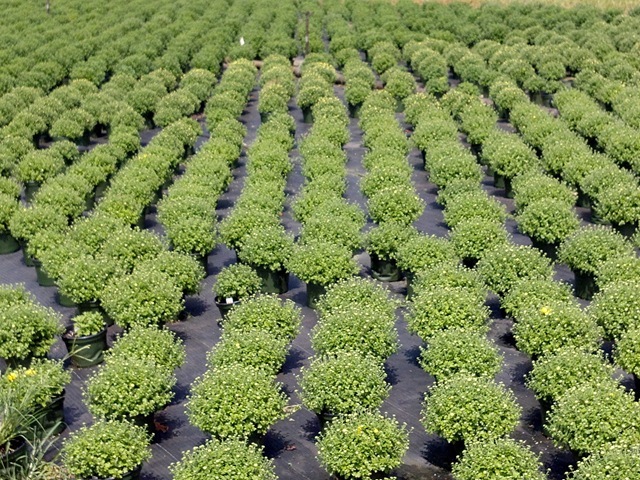 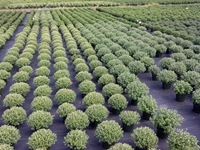 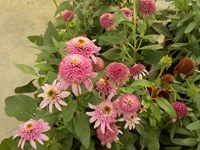 We have to estimate shippable plants to account for losses and mums that are out of spec. Here is a video update on the 12” mums. 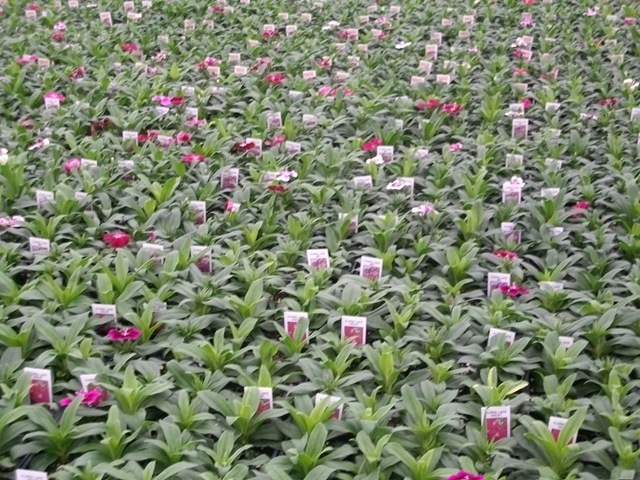 We have been keeping up with shipping cracking color so far but we may get into some tight buds next week if we ship faster than they crack open. 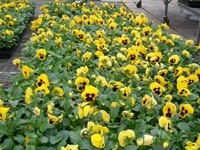 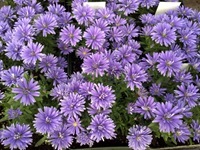 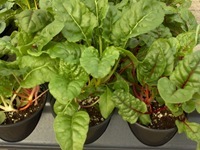 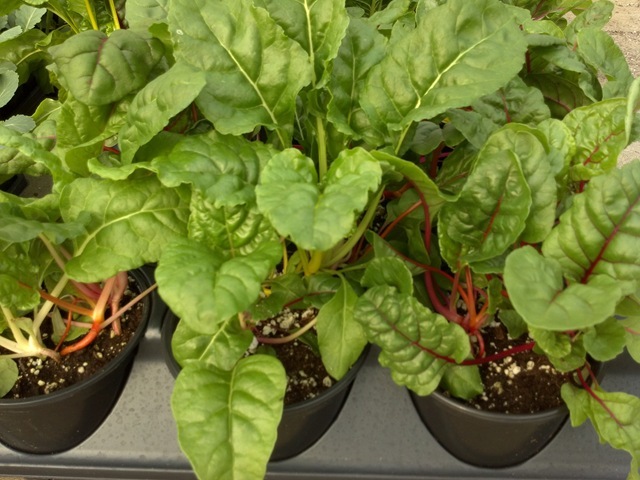 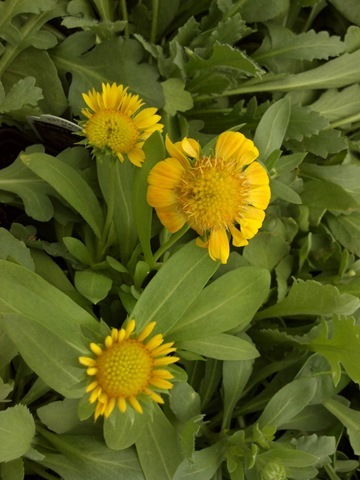 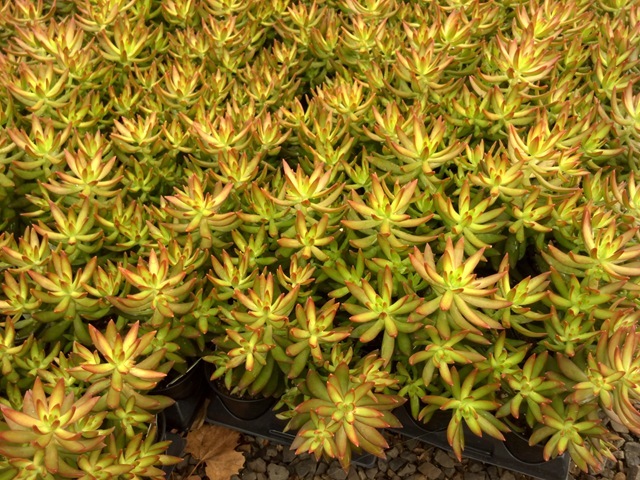 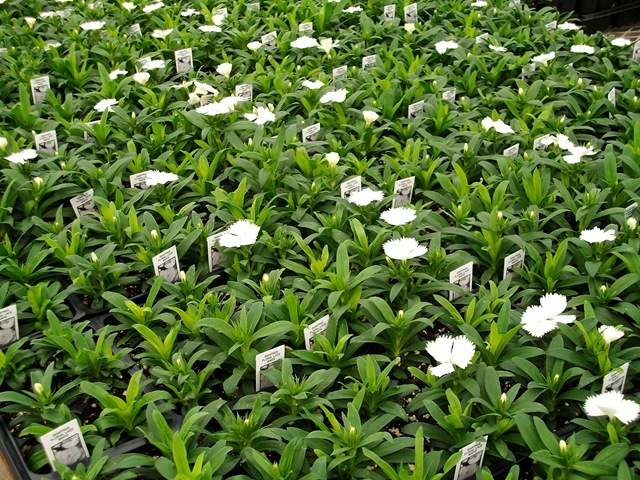 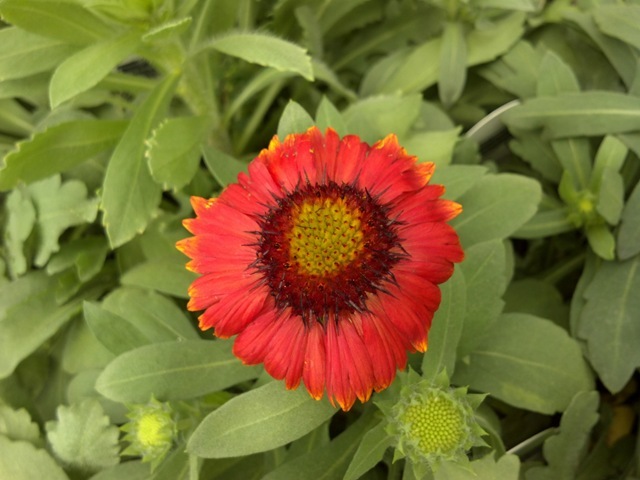 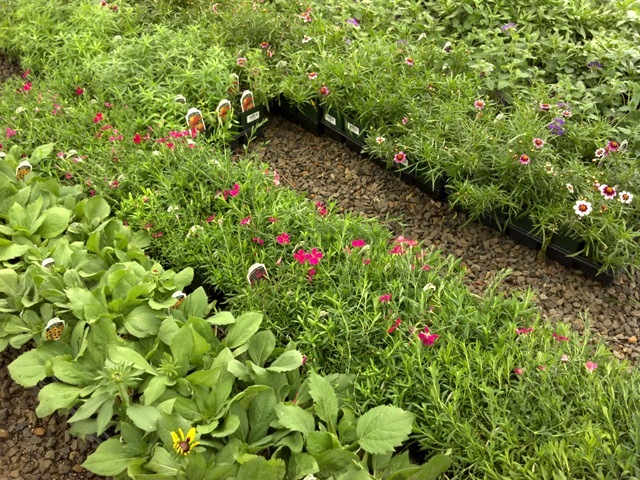 We have some quart perennials that were on this weeks availability and we have also added in our first planting of #6 Cool Wave Pansies and some #4.5 Sedum nussbaumerianum. 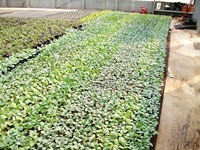 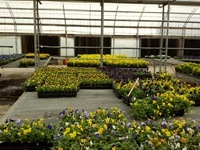 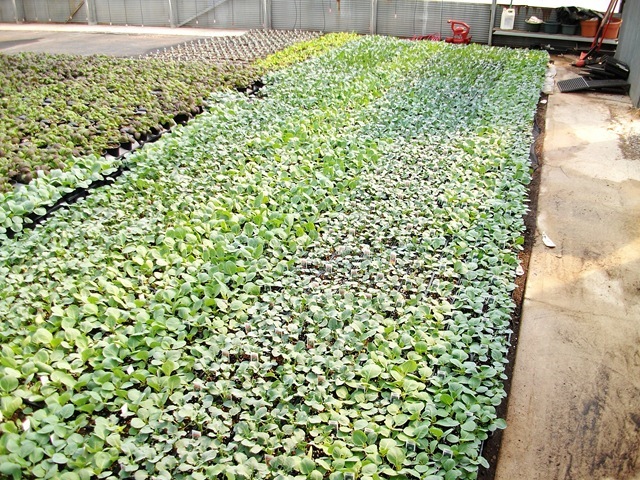 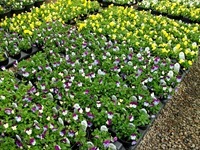 All our pansies and mums are coming on nicely. 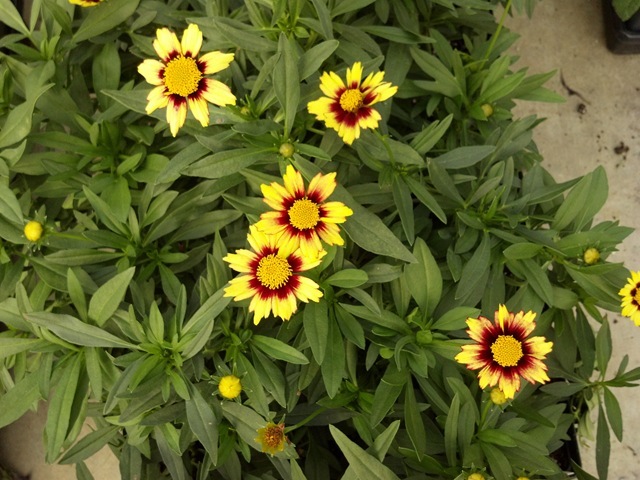 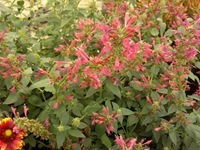 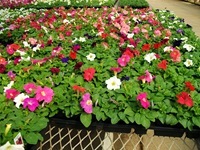 The cooler weather seems to be here and folks should be ready to start replacing their crispy, summer flower beds. Once again I am short on time today so you get two videos and lots of pictures again. 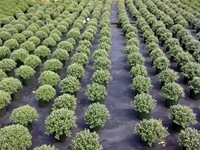 We have a lot of 12” mums that will be cracking color by next week. 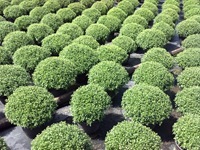 We also have a lot of orders to fill so even though we will have about 10,000 ready, we will have about 3,000 available for next week. 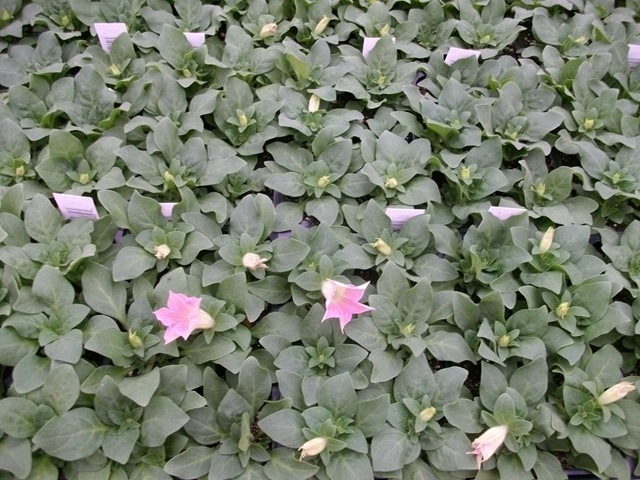 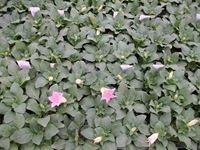 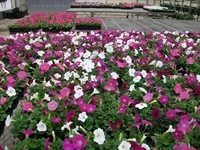 I have more J6 petunias, snapdragons and dianthus for next week but they do not have a lot of color. They are not in the inventory yet but will be added in as we transition crops on Monday or Tuesday. 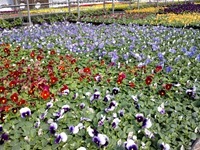 I expect them to be showing a lot more color on Monday but I want to look at them then first. 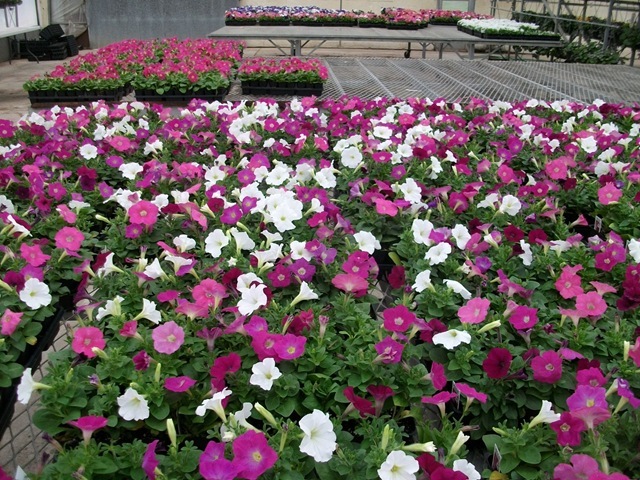 The 1801 petunias are ready but not pictured. 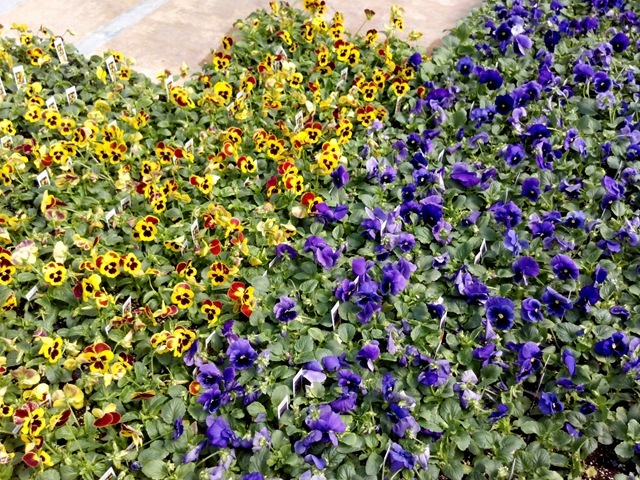 They have more color than the J6 except for the midnight and burgundy. 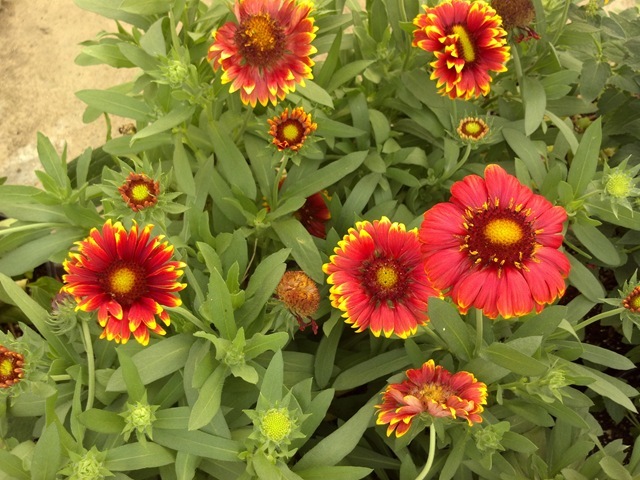 Running behind today so you get a short post. 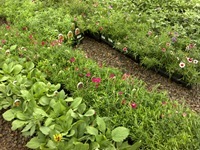 We had a thunderstorm hit last night about 5 pm as I was going home. 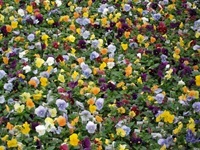 We must have been ground zero for a microburst downdraft. 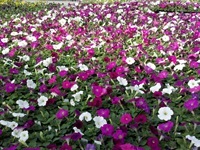 The winds were crazy for a while. 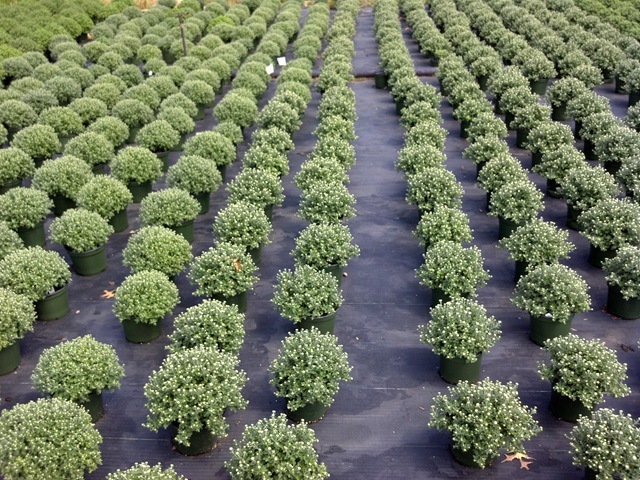 We have a lot of mums to set back up this morning. 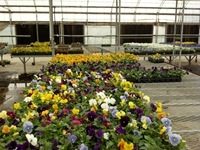 There were thousands blown over, but we got them back upright. 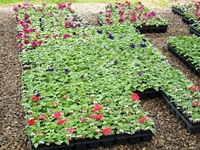 We didn’t loose very many to any breaking so that was a good thing plus we got a good rain out of it. 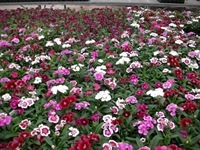 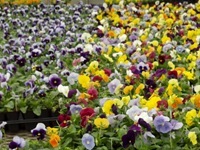 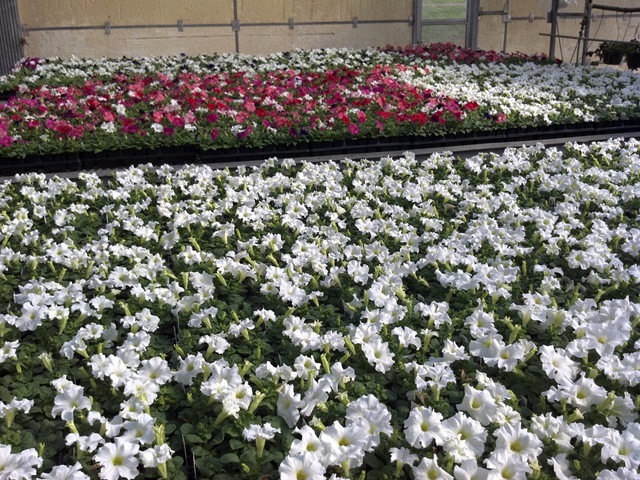 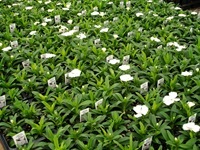 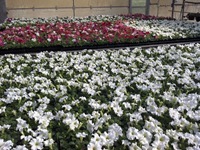 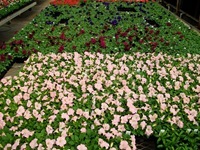 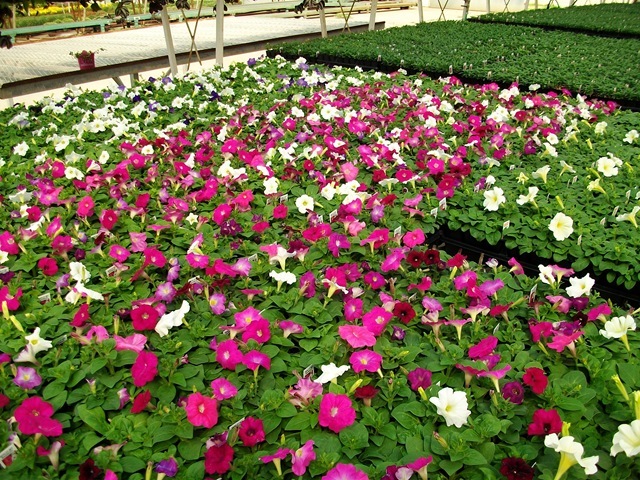 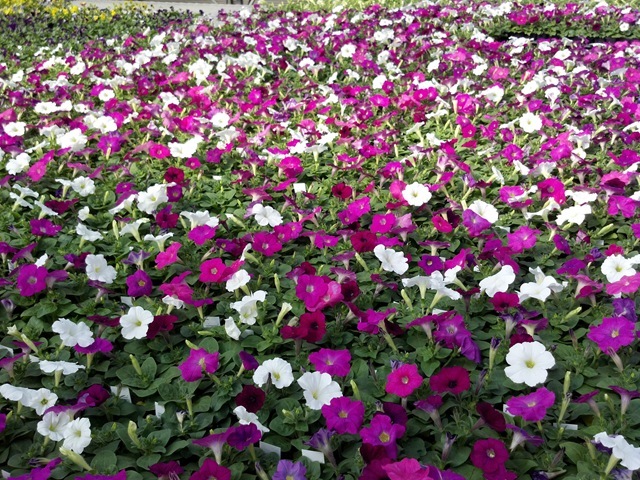 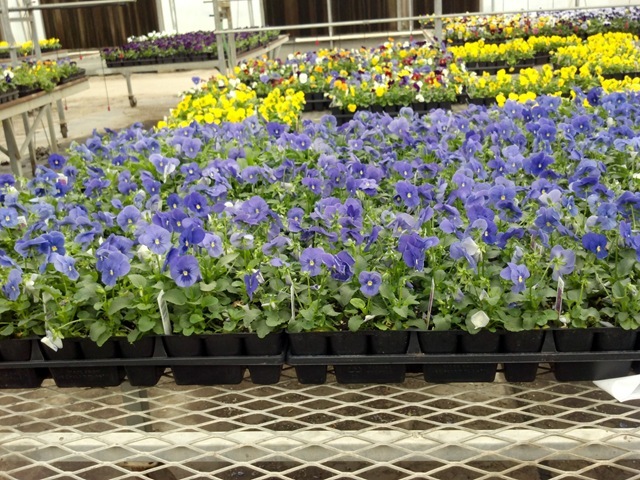 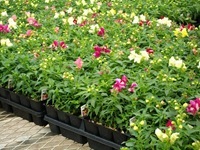 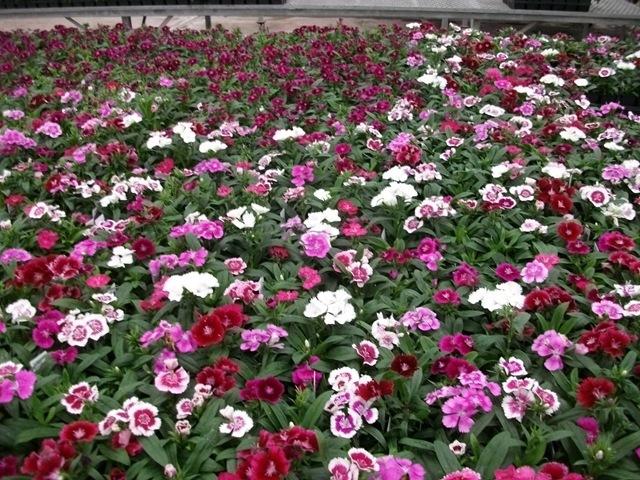 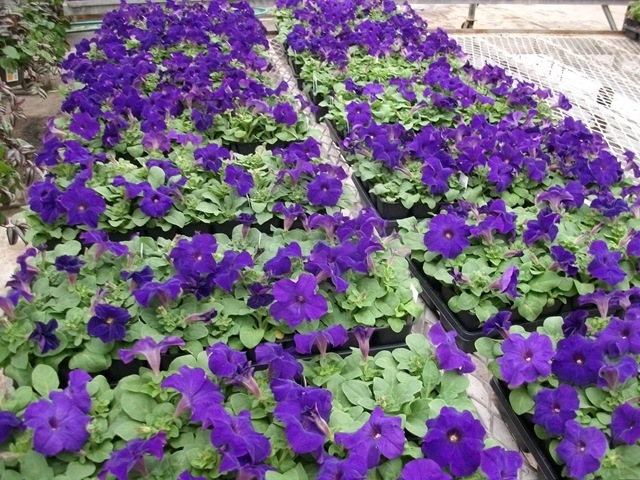 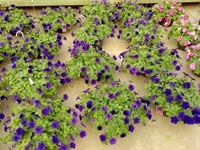 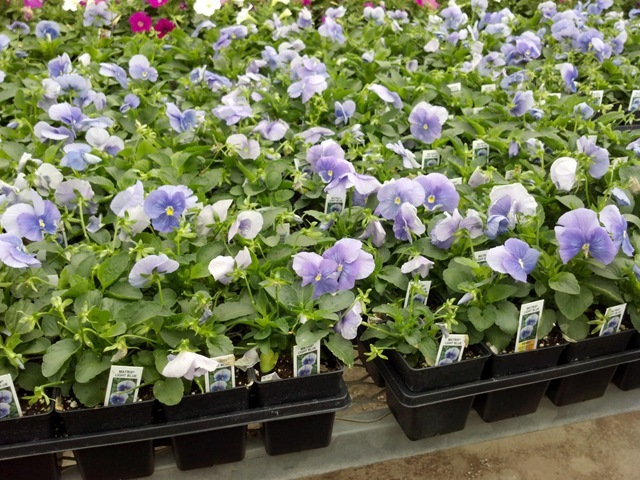 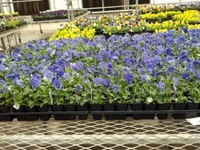 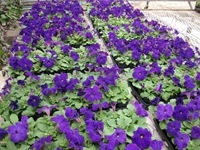 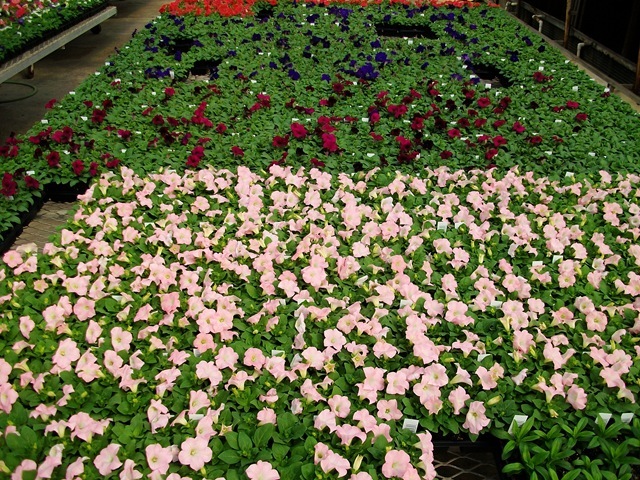 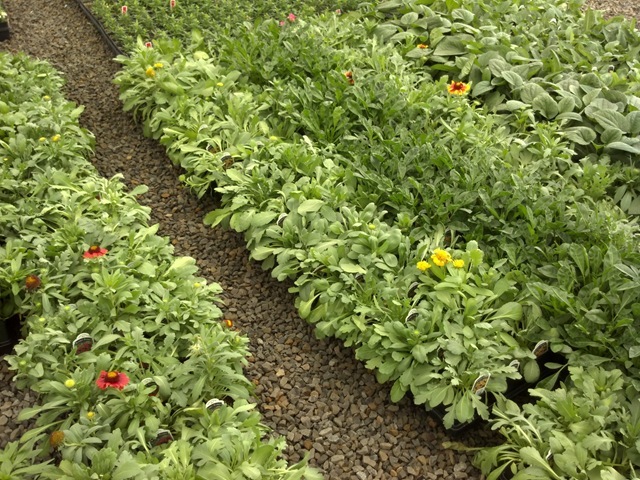 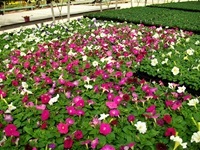 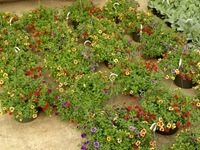 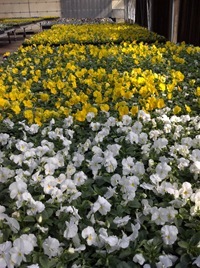 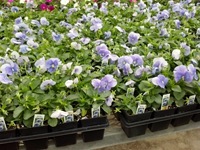 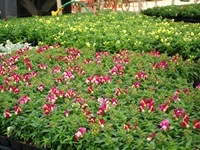 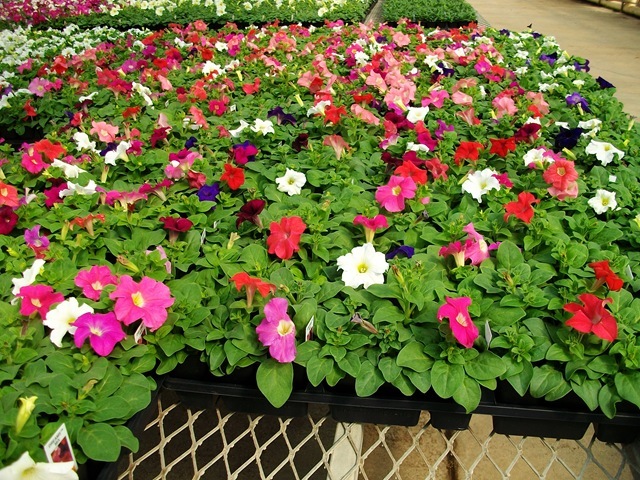 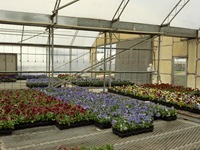 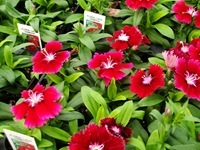 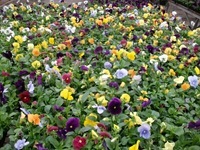 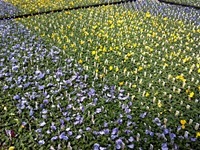 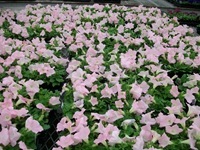 We have lots of pansies, petunias, dianthus and violas showing great color. 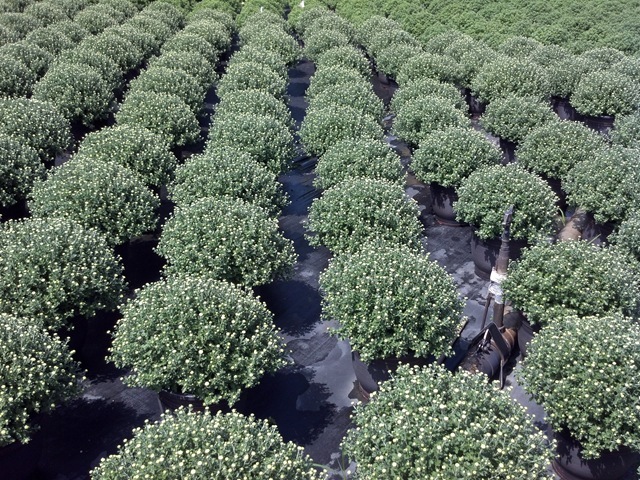 The mums are coming on fast. 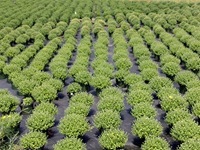 We have some with really big buds that should be cracking open in a week or so and a few that are already cracking open. 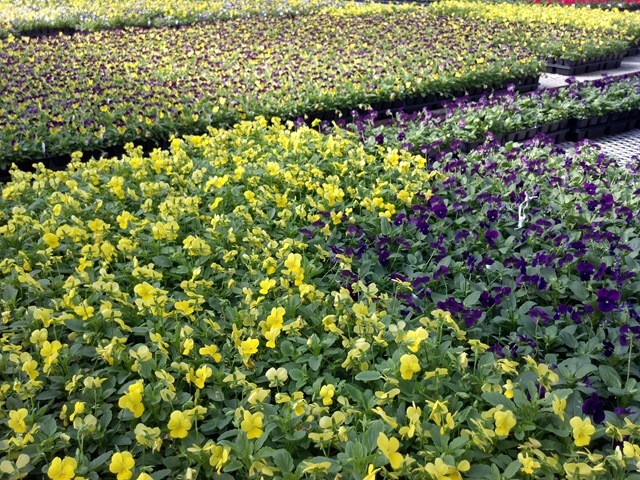 Don’t take my word for it though. 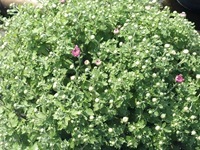 I have pictures and video proof! 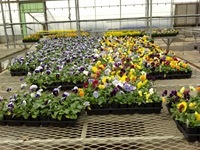 Check out the Current Availability link (it is working now) to see the numbers. 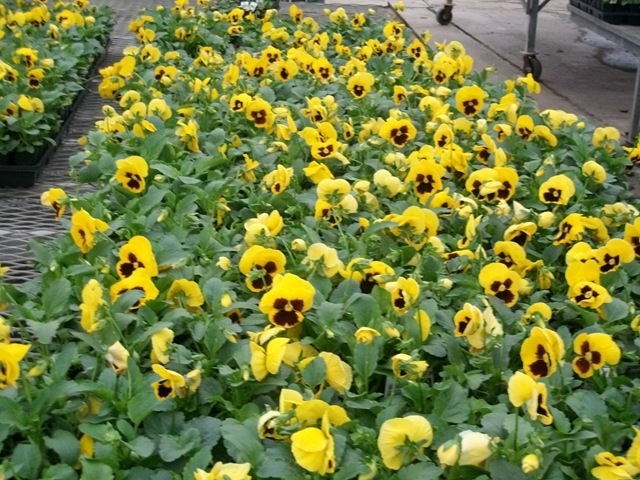 We may be adding some #4 Pansies to the availability early next week if they like the cool weather we have forecasted and finish filling out the pots.